Are you confused about diamond grading and pricing that’s all over the map? Having a hard time deciding whether to go for an I1-H, SI1-J, VS2-L? If you just want a beautiful diamond that needs no excuses how about this internally flawless, H colour princess cut solitaire? You can’t get much better than an internally flawless clarity and the H colour is near colourless. The diamond is accompanied by an 2003 HRD (Hoge Raad voor Diamant) Antwerp Belgium diamond certificate report. 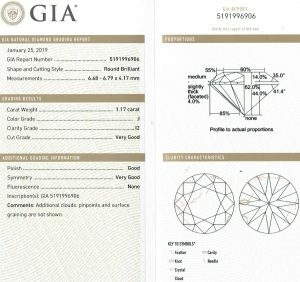 While we always prefer GIA reports for an accurate unbiased opinion of quality an HRD certificate is okay. Even if their opinion differs from GIA by a colour or clarity grade (as is often the case) this diamond is still a knockout. It’s perfectly square only off by 0.5%, decent table of 75% with a nice crown height of 8%. The 14 karat Lucida setting is still a popular choice for a solitaire of any shape. 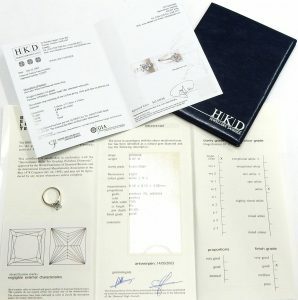 The finished ring comes with a July 2004 HKD Diamond Laboratories Canada appraisal suggesting an approximate value for the ring of $12,000.00. I’m sure the original owner was elated with this evaluation until it came time to trade it in. While we wholeheartedly feel this value is excessive, we also realize ALL appraisals are strictly opinions of value. Our opinion of a more competitive replacement value is closer to $5,000.00 CAD. The size 6 1/2 ring is in like new condition and estate priced at just $3,500.00. CAD. Stock #e12066. This is a great looking diamond with all the right credentials. Gemological Institute of America certified VS2 clarity, “I” colour, very good cut, good polish, very good symmetry and no fluorescence. The full GIA report can be seen online here. With an average diameter of 7.75mm this diamond will look like a little flashlight on your finger. Set it in a traditional solitaire or the latest custom halo creation. Let Bill Le Boeuf Jewellers can make you a ring to be proud of and save some $$$$$ with an estate diamond at the same time. It is currently set in a size 8 platinum diamond ring adding 0.79 carats of VS-GH bling (available separately for $2730.00). This 4 billion year old diamond is in perfect condition and estate priced at $14,300.00 CAD. Stock #e3739. Ever considered a fancy shaped diamond? They offer an interesting alternative to the industry benchmark round brilliant cut. Fancy shaped diamonds are almost always less expensive compared to round, sometimes by close to 40%. 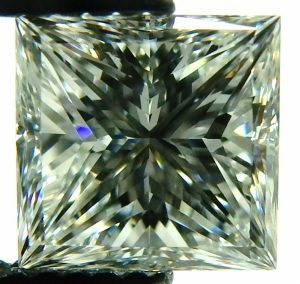 This estate emerald cut faces up much nicer than many I2 clairty diamonds I’ve seen. The white feather type inclusions can be seen without without artificial magnification but that doesn’t mean the diamond doesn’t sparkle. The very good H colour, no fluorescence and very good polish ensure it still twinkles like a diamond costing several times more. The recent (February 2019) Gemological Institute of America certificate can be seen online here. Currently set into a brand new 14 karat white gold pendant setting with 14 karat white gold Italian rolo chain. The Art Deco inspired design contains 35 round high quality VS-SI-GH diamonds adding 0.57 carats of extra sparkle. The pendant setting is available for an extra $1,500.00 CAD. If you’ve got another project in mind let us know; we’d love to custom make it for you. 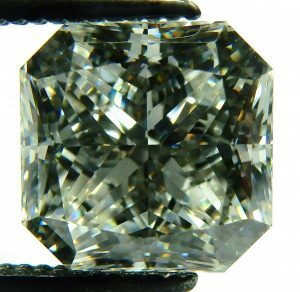 You won’t believe how nice and how large an estate diamond can be purchased for only $2,000.00 CAD, but only at Bill Le Boeuf Jewellers. Stock #e12003. I can’t ever remember selling a diamond in a setting that hasn’t been assembled into a finished piece of jewellery. I suppose there’s a first for everything so we’re going to give it a shot. 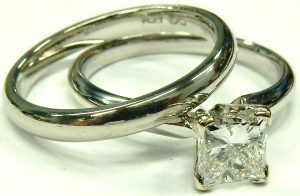 Why recycle a perfectly good platinum 4 prong setting when there is a good chance we’ll just have to buy a new one to make this pretty diamond into a beautiful engagement ring or another piece of jewellery. This 0.65 gram platinum head would cost over $100.00 to replace but it comes free with the purchase of this diamond. The diamond is a very good cut 0.41 carat princess cut with VS2 clarity and I colour. Measurements of 4.05mm x 3.95mm x 2.98mm with a good depth of 75.4% and a table of 77% guarentee excellent sparkle and brilliance. Comes with GIA certificate #15450271. Estate priced at $799.00. Stock #e8355. This diamond is a great example of why you should never judge the beauty of a diamond by simply looking at a gemological report. 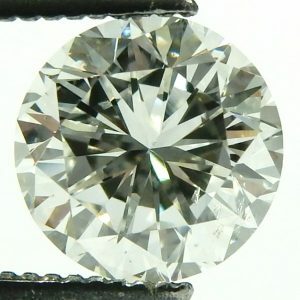 Most accurately graded I1 clairity diamonds are quite beautiful if as well cut as this one. What I find remarkable is the diamond was graded an I1. The translucent white, feather type inclusion is small enough and insignificant enough that we thought it was a pretty safe bet to receive a SI2 clarity grade from The Gemological Institute of America. 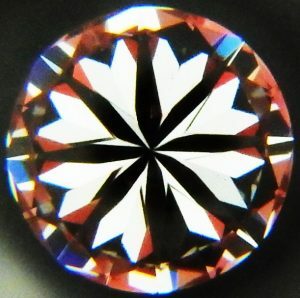 In this magnified dark field contrasting photomicrograph it’s not difficult to see the inclusion just to the right of centre in the diamonds pavilion. In a regular viewing situation the inclusion all but disappears in the brilliance and dispersion offered by the very good cut diamond. In these two photographs the inclusion is much more difficult to see without artificial magnification. From a naked eye perspective this is a close as you could possibly get to a diamond with a GIA certified I1 clarity grade that looks flawless to a naked eye. 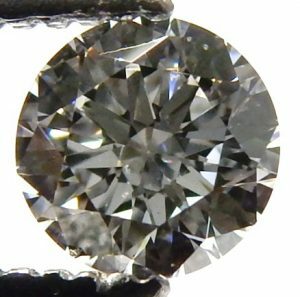 It would be a lie to say we were not disappointed with the I1 grade but it’s pretty hard to argue with the world’s undisputed authority for diamond grading. After all it was The Gemological Institute of America that developed the system how all diamonds are graded today. 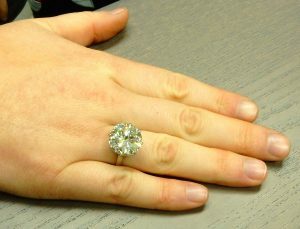 Some savvy Bill Le Boeuf Jewellers client is going to get an amazing diamond considering its price is only $2,380.00 CAD. 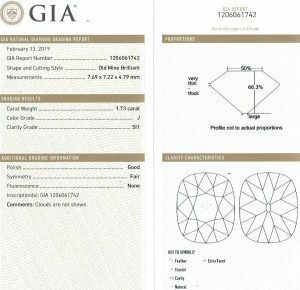 The full January 2019 GIA diamond grading report can be seen online here. Even within a specific clarity or colour grade there is a range; a low SI2 is basically the same as a very good I1. A low J colour grade is pretty much the same as a very high K colour. At least if you’re dealing with GIA certified diamonds you know you are looking at accurate, unbiased opinions from a not for profit educational institution that has no direct interest in the commerce of diamonds or jewellery. You should also know that GIA does not appraise diamonds, the are only interested in accurately documenting the quality. This is one amazing looking diamond considering the estate price of $2,380.00 CAD. Stock #e11956. If you’re buying a princess cut diamond wouldn’t you prefer to buy a well cut example? Finding a nicely cut princess cut can be a difficult exercise since there are no widely accepted standards for this type of diamond. Many examples we see are cut really deep with very large tables. This is an efficient method to produce a heavy diamond from a given piece of rough but it certainly won’t be the most dazzling to look at. This well cut 0.56 carat originally came to us as a damaged 0.67 carat. Our instructions to our master diamond cutter was to re-cut it to look great and let the finished weight be a function of the good cut. Many princess cut diamonds have been cut with a priority on producing a heavy diamond at the expense of a good quality cut. This freshly re-cut princess measures 4.30mm x 4.52mm x 3.35mm with a very small 70% table and a generous crown height. These 2 characteristics will always give you a good idea of how nicely cut any princess is. If you’re contemplating a stone that looks like an upside down triangle, lacking a decent crown, chances are it’s been poorly cut. As always, do some homework and learn a little about diamonds. Come in and have a look at ours, we can show you how and why sometimes they just look better. Better looking and a better price make our estate diamonds the way to go. At only $1,100.00 CAD we know the value is better too. Stock #e10642. From cell phones to automobiles and refrigerators to ping pong balls; nearly every consumer brand name item carries a manufacturers suggested retail price. The key to getting great value is knowing if and where you can get a lower than MSRP price. Shopping for diamonds is very difficult because they do not have a suggested retail price. The price you see is dictated by the level of profit needed by the vendor to cover their overhead and hopefully maintain a reasonable surplus to supply a decent income for the employees and owners. Modern commerce is extremely competitive, we welcome and encourage our customers to become informed and seek out the best value in diamonds. When you know what you’re comparing you know how to find the best value. Bill Le Boeuf Jewellers is always about full disclosure with all our diamonds and jewellery in general. 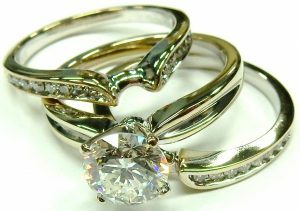 We’ll always show you everything needed for you to determine where the best value is in both new and estate jewellery. 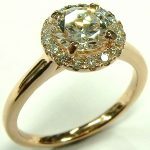 Over 60 years experience, much lower than average overhead, unique diamond sourcing/buying strategies and generally just a lower markup give Bill Le Boeuf Jewellers perhaps an unfair advantage. I’m guessing our clients don’t really care about all that, they just care about getting the absolute best value. We’re happy to deliver fantastic value plus deliver a level of service only a fiercely independent vendor can offer. This pretty diamond is a great example of the type of value we can offer at Bill Le Boeuf Jewellers. It’s GIA certified, so comparing its attributes are just a click away by looking at the certification report online. 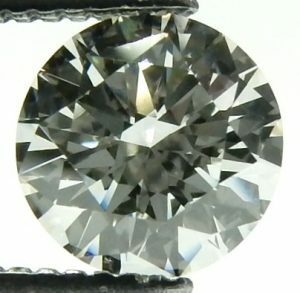 This diamond was purchased in the spring of 2017 for almost $1300.00 plus tax. It comes complete with the original bill of sale, copy of GIA certificate, diamond card, guarantee and folder. The diamond was never assembled into a ring. It remains in the little protective plastic/cardboard holder that it was delivered in. Whether it’s a $500.00 diamond or a $500,000.00 diamond everyone is looking for the best value. Take your time, look at the certificate (hopefully it’s a Gemological Institute of America report), don’t be influenced by perceived discounts and most of all shop around. If this diamond is of interest to you please contact us or stop in to have a closer look. For $555.00 we feel it is the best value around. Dealer and trade inquires always welcome. Stock #e10707. 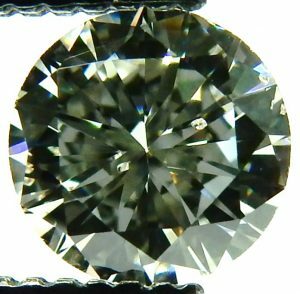 This very good cut 0.80 carat diamond has a diameter only 6% smaller compared to a very good cut 1.00 carat diamond, yet this one will cost you more than 50% less $$$$$$$. That’s one of the crazy things about diamonds; as the size increases the price goes up exponentially. The general rule of thumb goes, as the weight doubles the price quadruples. If you’ve ever played around with pricing out a nice 5.00 carat diamond you’ll see this relationship in action. This estate diamond was just certified January 25 2019 at The Gemological Institute of America with very good results and we stress the “very good”. 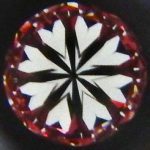 This diamond is a triple very good; very good cut, very good polish and very good symmetry. There’s little to fault with this laser engraved 0.80 carat SI1-H diamond. The price of only $3,300.00 is likely the best you’re going to encounter too. Measuring 5.96mm average diameter results in a bigger footprint compared to many diamonds of similar weight. Bring us a picture of the kind of ring or jewellery you’d like and let us make something unique and beautiful just for you. We’ve been creating jewellery from the same Downtown Barrie Location for over 60 years. Even our phone number hasn’t changed since 1958 (705) 728 3343. You can find us under the big blue diamond at 52 Dunlop St. West. Estate priced at $3,300.00 CAD. Stock #e11957. Actions speak louder than words is a great way to describe what we do at Bill Le Boeuf Jewellers. We’ve all heard the claims of wholesale direct prices, lowest prices guaranteed etc. These words usually come from sources who can’t come close to actually delivering their claims. Those who make lots of noise typically the easiest to out value when the rubber meets the road. Whether you’ve been a customer of Bill Le Boeuf Jewellers for decades or you’ve stumbled across our website for the first time today. Welcome to the world of true value pricing without the song and dance. Our latest estate diamond came out of an old Birks engagement ring from the 1950s. It had a small chip on the girdle and the setting was a little more worn than we like to see. 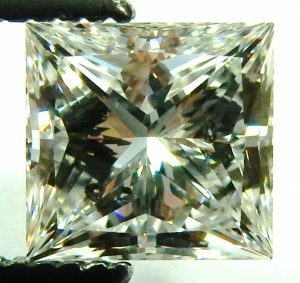 Our master diamond cutter performed his usual magic transforming the damaged vintage diamond into an excellent cut modern round brilliant. The diamond lost about 11% of its original weight but the results are more than worth the sacrifice. The cut report from GIA Facetware details all the geometry that makes the diamond sparkle more than almost any you’re likely to encounter. High VS1 clarity, very nice F colour and no fluorescence guarantee a show of brilliance and dispersion second to none. Difficult as it is for me to take a good close up picture through polarized light you can see this diamond makes a pretty nice hearts and arrows pattern. We’ll let the diamond speak for itself when it comes to showing who really offers the best value. 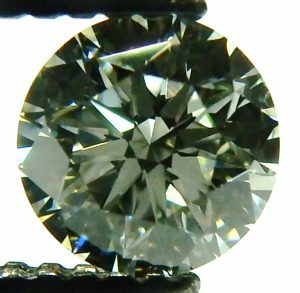 0.62 carat, VS1 clairty, F colour, excellent cut and no fluorescence for $2,300.00 CAD. Wholesale and dealer inquires are always welcome. Stock #e12030. 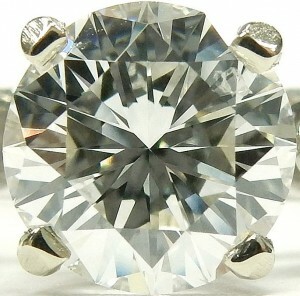 The most popular shape diamond has always been the round brilliant cut. It is the most brilliant and dispersive of any shape. The diamond was just completely re-cut from some previous damage. 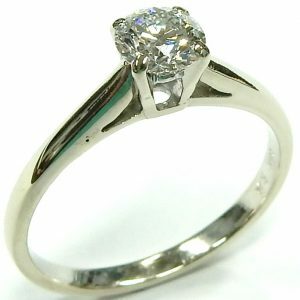 It is now in perfect condition measuring 4.99mm – 4.94mm x 3.22mm and weighs an even 1/2 carat. It is estate priced at $1,195.00 and represents excellent value. Stock #e6344. At Bill Le Boeuf Jewellers we want to be your diamond destination. Our unique ability to provide diamonds at the absolute best value is our priority. The relationships we have developed with world wide suppliers over the last half century have allowed us to offer exceptional diamonds at extraordinary prices. Our storied location in the heart of downtown Barrie has seen many jewellers come and go. We have been tempted over the years to expand with more locations in busy shopping centres. The thought of massive rents, landlord commissions based on gross sales, expensive mandatory renovations every few years and no guarantee of lease renewal made us realize we couldn’t operate in that kind of environment without charging substantially more for all the products we sell. This diamond is evidence of those points. Certified by the Gemological Institute of America 1.28 carat VVS1-G excellent cut, very good polish, excellent symmetry with no fluorescence. Certificate details can be seen here. This is an expensive diamond, but probably one of the best values in the market today. Like our slogan says “price is simply what you pay, VALUE is what you get”. Estate price $15,900.00 CAD. Stock #e7483. Currently in an 18 gram platinum ring set with small shoulder diamonds totalling 0.90 carats of VS1-G quality available separately for $4500.00. Stock #e7483. Includes a Gemological Institute of American report detailing all the intricate characteristics that help establish value. 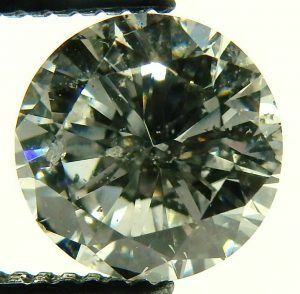 The diamond was graded a VS1 clarity, F colour, very good cut, very good polish, very good symmetry and no fluorescence. With this information it’s easy to establish a value with any comparable you may considering. As always be sure to compare equal reports because some grade to a much more “loose” standard than GIA. This diamond measures 6.94mm – 6.98mm x 4.08mm giving it a face up appearance close to many 1.50 carat diamonds that are not cut very well. The GIA report #1152803947 can be seen at http://www.gia.edu/report-check?reportno=1152803947. 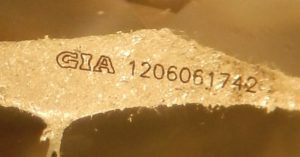 Even if the GIA certificate is lost the laser engraved report number on the girdle can be used to order a duplicate from GIA. This diamond is priced at $14,000.00. Stock #e7870. Currently mounted in a very pretty white gold setting with pear shaped shoulder diamonds available separately. Perfect D colour and GIA certified too. You almost never encounter a perfect D colour. Diamonds almost always form with trace amounts of elements other than carbon causing subtle tints of colour. 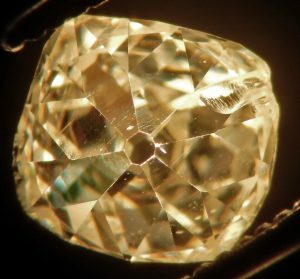 Most often a few molecules of nitrogen cause diamonds to show just a hint of yellow colour. This colour is expressed alphabetically on a scale from D through Z. To have a GIA certified D colour is the highest standard in the industry. 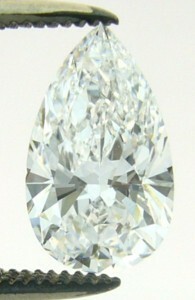 The clarity of this diamond is also quite exceptional at VVS2. 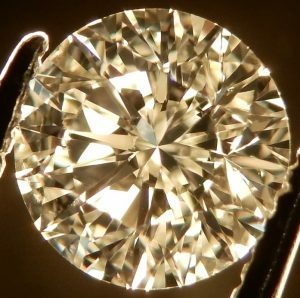 The overall cut, symmetry and polish have all been graded very good as compared to GIA’s strict excellent cut standards. No ultraviolet fluorescence finishes off all the details you need to know when comparing value. Measuring 6.30mm – 6.35mm x 4.07mm will make this diamond easy to find a standard 1.00 carat setting for. The GIA certificate can be seen online here. If you want to learn more about the 4Cs of diamond grading GIA’s interactive tool will show you everything you need to know when determining the quality of a diamond (sorry, not supported by Apple devices). The July 2015 GIA certificate is included to the estate price of $13,800.00 CAD, making this diamond the best value around. Currently set in a 14 karat white and rose gold setting available separately for $695.00.Stock #e9093. Very nice diamond at a very nice price makes a very nice starting point for a great piece of jewellery. Recently certified at the Gemological Institute of America with excellent results of VVS2 clarity with an equally impressive colour grade of F. The full August 2016 report can be seen online here. There’s a good chance we have another diamond of similar quality in stock that would allow us to make a great pair of earrings totaling over 1.00 carat in weight. A stand alone solitaire ring or simple pendant would make a nice home for this diamond too. Estate priced at just $1,250.00 CAD. Stock #e9849. 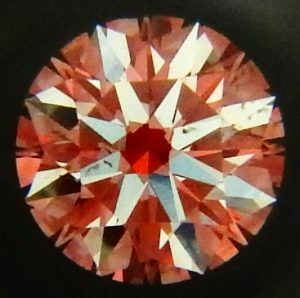 This diamond came in with an Amsterdam diamond report declaring the diamond “loupe clean of river colour”. These old terms refer to a flawless clarity with perfect colour. Hoping for a similar opinion from the Gemological Institute of America the diamond was sent to New York for a more internationally accepted opinion. The results came back with a VVS1 clarity with an E colour. Both characteristics just 1 grade off perfect. 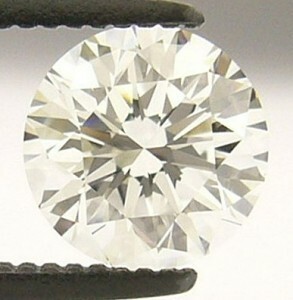 Fewer than 4% of diamonds receive a quality grade like this or better. 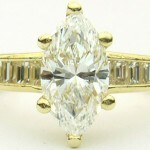 The added length of a fancy shaped marquise make them look bigger than an ordinary round diamond. The actual dimensions of 10.32mm x 5.62mm x 3.73 make for an impressive display. GIA report #2165031879 describes the symmetry and polish both as very good. 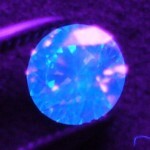 The diamond also will exhibit strong blue fluorescence when exposed to long wave ultra violet light. The report can be seen at GIA Estate priced at $15,500.00 CAD. Stock #e8067. 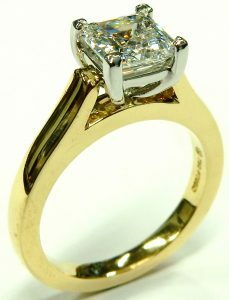 The diamond is currently mounted in an 18 karat yellow gold setting with baguette cut diamonds available separately. We do love those great big diamonds that are the stars of anybody’s dinner party, but we also do smaller diamonds better than anyone else too. Here are a couple of freshly re-manufactured estate round brilliant cut diamonds. Both of these diamonds were perfectly acceptable but not outstanding in any sense as they only had an average cut. They each underwent a full re-cutting to bring up their cutting grade to excellent by GIA standards. Although they lost around 20% of their original weight they have actually increased in value. That doesn’t mean they’re expensive; on the contrary. Due to their estate nature we are able to offer them for under a traditional wholesale price (much to the frustration of our competition). The 0.40 carat SI1-J is priced at only $600.00 CAD and the 0.35 carat VS2-F is just $700.00. The colour and clarity are 100% guaranteed accurate to Gemological Institute of America standards and both diamonds have no fluorescence. 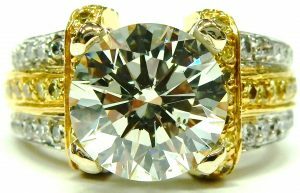 We are the only store in the area with two full time, on staff, GIA certified diamond graders plus a Graduate Gemologist with 30 years experience. We have 1000s of other loose diamonds in stock, if you don’t see it on our website contact us. 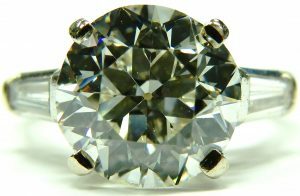 You can also check out our online database with thousands more accurately graded GIA certified loose diamonds. As always we encourage you to shop our pricing anywhere, we think you’ll agree that Bill Le Boeuf Jewellers offers the best value around. Stock numbers e11851 (0.40ct. 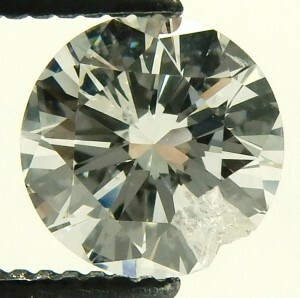 SI1-J) and e11852 (0.35ct. VS2-F). Interesting looking brownish/orange diamond. The 0.44 carat diamond has been treated to create a stable new colour. 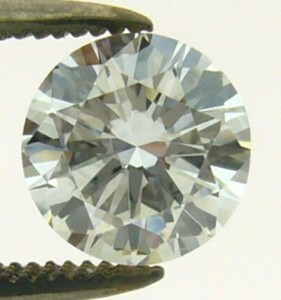 The diamond is well cut and a SI1 clarity. It measures 4.90mm x 3.05mm. This would make an interesting alternative to a white diamond engagement ring. Estate priced at $590.00. Stock #e6251. Cushion shaped brilliant cut diamonds are a popular alternative to a round diamond. They don’t show up in our estate department very often and this one is very exciting. Its got good size at well over 2 carats. It has absolutely perfect D colour as certified by GIA; excellent polish, very good symmetry and medium blue fluorescence round out this beautiful diamonds quality characteristics. The full Gemological Institute of America grading report can be seen here. 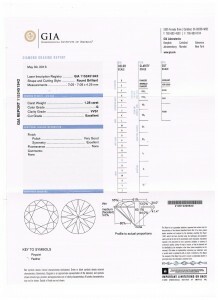 ALWAYS ALWAYS ALWAYS insist on a GIA diamond grading certificate if you’re considering an important diamond purchase. 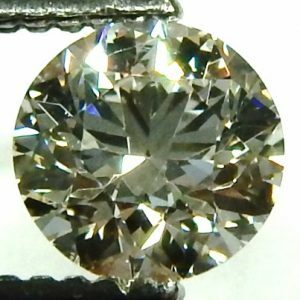 We all too often see poorly and inaccurately graded diamonds. 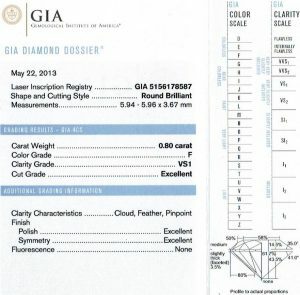 Almost all of our larger diamonds come with GIA’s unbiased grading report. We’ll always place our customers interests first at Bill Le Boeuf Jewellers. Full, accurate disclosure plus pricing allow our clients to easily compare diamonds. There are few jewellers with enough confidence to display not only pricing but all the other important quality characteristics required to determine value. This diamond is currently set in a custom made 18 karat rose gold/platinum setting with small accent diamonds running down the shoulders. The setting is available separately for an additional $1,000.00 CAD. 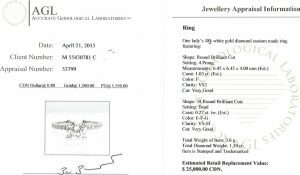 The diamond and ring come with a Harold Weinstein Ltd. May 2018 document of appraisal. Stock #e11847. Only available at Bill Le Boeuf Jewellers under the big blue neon diamond in Downtown Barrie for over 60 years. 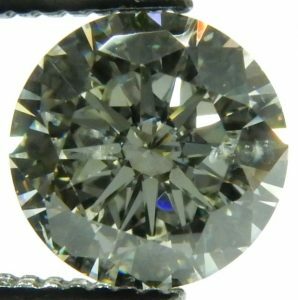 1.40 carat round brilliant cut diamond with a GIA certified very good cut, excellent polish, excellent symmetry and no fluorescence. Its 7.1mm diameter is way more than the typical 1.00 carat diamond and casts a footprint more than 25% larger. The full Gemological Institute of America report can be seen online here. The ring is currently set in a very sturdy 17.5 gram platinum & 18 karat rose gold engagement/wedding ring set with 1.56 carats of additional SI1-G diamonds. 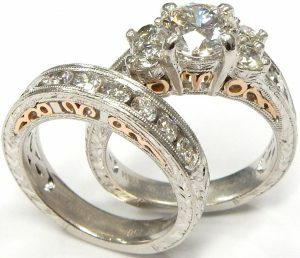 The rings are available separately for an additional $3,300.00 CAD. Lurking within this 1.50 carat fair cut diamond is an excellent cut 1.37 carat diamond. Some careful re-proportioning of the diamond will achieve a superior cut but it will weigh close to 10% less. Such is the dilemma every diamond cutter faces when considering faceting a rough diamond; cut to maximize finished weight (and potentially profit) or cut to maximize sparkle and brilliance but end up with a smaller stone. 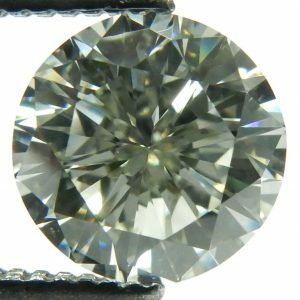 Not only will you end up with a smaller diamond in order to achieve an excellent cut, in many cases the premium cut diamond may have a psychological disadvantage to anyone comparing it to a heavier stone of lower cut grade priced the same. 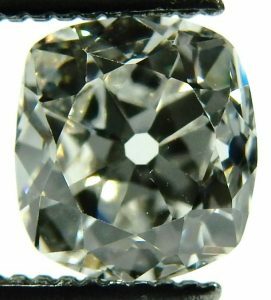 Compare this estate diamond to the same quality 1.50 carat or an excellent cut 1.37 carat diamond, it is still priced better than anything else currently in the market (retail or wholesale). We just had this diamond certified by the Gemological Institute of America November 2018 with very nice results. Strong SI1 clarity, G colour, good symmetry, good polish and no fluorescence. Sure the table is a few percentage points too big, the crown angle is a few degrees too steep and the total depth is 0.15mm too deep but still it looks amazing. GIA scrutinize the geometry of diamond cut like no other. They offer completely impartial grading analysis as they have no interest in the price or the commerce of diamonds. Always insist the diamond you are considering has been GIA certified, not simply certified by someone with GIA training and credentials. 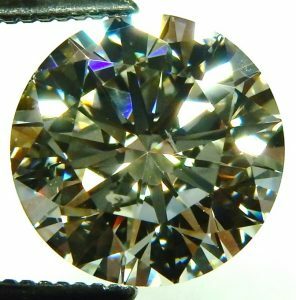 This diamond is also listed on our wholesale dealer only database for the same price as you see here, so don’t think about it for too long. 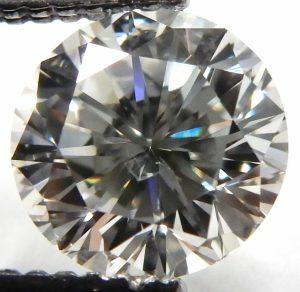 At $10,000.00 CAD it’s less than any equivalent GIA certified diamond anywhere! We sell wholesale and we sell retail, it’s all the same to us. We love connecting people with amazing value whether it’s a wholesale colleague or for our own retail client. From big box store to large retail chains and even the latest greatest online vendor. We’re not afraid to compete with any and all competition. Bill Le Boeuf Jewellers 60 years experience, unique business and operational advantages allow us the enviable position of being able to offer better value than anyone. We don’t take this statement lightly, we really mean it. 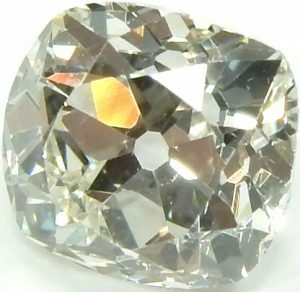 This pretty diamond is estate priced at just $10,000.00 CAD. With a weakening Canadian dollar this diamond offers even more value. Stock #e11743. Take a good look because they don’t come by very often. A “D” colour diamond is exceptionally rare, especially if that D rating comes from the most trusted name in the diamond industry. The diamond was certified from the Gemological Institute of America with the highest possible colour rating. The report can be viewed at GIA. The VS2 clarity grade with no fluorescence really make this one sparkle. The extra length of a pear shape makes the diamond appear much bigger than the actual weight of 1.20 carats. With measurements of 9.64mm x 5.83mm x 3.59mm, this pear shape puts down a much bigger footprint than most poorly cut overly deep cut examples with similar weight. 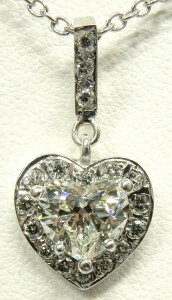 The diamond is currently set in a heavy platinum setting that is available separately. Diamond by itself is estate priced at $12,300.00 CAD. Stock #e8147. We never said diamonds weren’t expensive but that doesn’t mean they can’t have amazing value. Especially when we’re talking about a GIA certified (November 2018) estate diamond that we feel is the best value in the world! We’re not kidding, we’ve strategically priced this diamond to be less expensive than anything available of the same specifications. We’ve compared it to online vendors, local mall stores, diamond exchanges, big box stores and so called wholesale to the public sources. A better price on a diamond like this can’t be had, period! This is the time of year you hear about 30, 40, 50% off and more diamond sales; our sophisticated clients know better. For $22,000.00 CAD this diamond offers the best value anywhere. It was just certified by the Gemological Institute of America with very good cut, excellent polish, excellent symmetry and no fluorescence. The full report can be seen online here. With an average diameter of 8.06mm it puts down a larger footprint than many comparable 2.00 carat diamonds. The best feature of this diamond is that it’s “eye clean”. Eye clean means when viewed without artificial magnification the inclusions are invisible. While it’s not flawless the inclusions are mostly isolated to the outside edge making them far less visible. This diamond is also currently listed on our trade access only wholesale database for the same price as you see here, so don’t think about it for too long. We sell wholesale and we sell retail, it’s all the same to us. We love connecting people with amazing value whether it’s a wholesale colleague or our own retail client. The diamond is currently unset, we’re waiting for you to come in with a custom idea that we can turn into reality. We insist you shop this diamond and its credentials around. I think you’ll find the value that Bill Le Boeuf Jewellers can offer can’t be beat. Estate price $22,000.00 CAD. (bank wire price $21,560.00 CAD). Stock #e11744. Wholesale dealer inquiries are welcome. 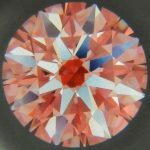 Jumbo 4.31 carat round brilliant cut diamond with a Gemological Institute of America (New York) report certifying the diamond as a SI2 clarity, OP colour and a good cut. The full April 24 2017 GIA report can be seen here. 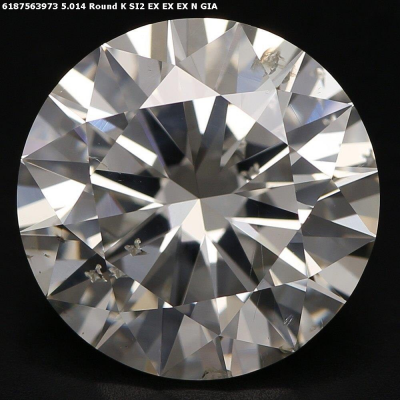 If you’re familiar with diamond geometry and optics, the report should give you a pretty good idea of what the big 10.6mm diameter stone looks like in person. The very small 54% table, slightly steeper 35.5 degree crown angle and generous 16% crown height gives this stone a beautiful antique look with ample dispersion and brilliance. The large culet and slightly warmer hue of the OP colour grade reinforces the vintage look as most old diamonds exhibit a similar tint. 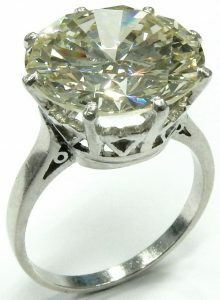 The diamond is currently set in a 6.8 gram, 18 karat white gold ring containing 150 other diamonds. The small diamonds range in size from tiny bead set 1.1mm diameter examples set in the halo and galleries to significant 3.1mm channel set examples running down both shoulders. The additional 2.00 carats of high quality VS-H diamonds bring the estimated total diamond weight to a dazzling 6.31 carats. While we’re hoping to keep the 4.31 carat diamond and beautiful halo setting together as a complete ring, the supersized diamond is available by itself for $28000.00 Canadian. One of our onsite goldsmiths can adjust the size 5 ring up or down a size or two in just a day or so. This fantastic ring is in like new, hardly worn condition. The original bright white factory rhodium finish is still fully intact. Complete ring is available for $31025.00 CAD (trade ins and dealer inquiries are welcomed). Stock #e10459. 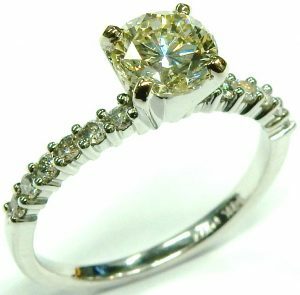 1.45 carat VVS2 fancy vivid yellow colour enhanced round brilliant cut diamond GIA certified #5121011261. Details of the certificate can be viewed on GIA’s website www.gia.edu (verify a report). The loose diamond is available alone for $9250.00 CAD. This complete ring can be viewed in the estate rings over $5000.00 section. Stock #e737. Everyone knows where to find the best value when it comes to accurate, honestly graded diamonds. You won’t find it in the malls, and certainly not at one of the chain stores. Believe it or not you can usually find it at a long time independent home town jeweller. They’ve got the knowledge, experience and connections. They have usually owned their own stand alone building for decades so their overhead costs are far less. And if they’re like us at Bill Le Boeuf Jewellers their work is more than just a job, it’s a honoured tradition of service we are extremely proud of. It’s really fun to sell those really big multi-carat diamonds, but even the more attainable and affordable sizes like this one are exciting. When I know there is no better value than this it’s easy to get enthused. Looking for something a little different? 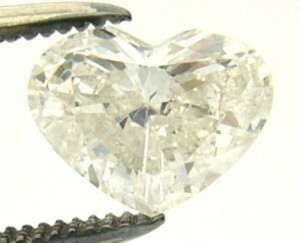 How about trying a very uncommon heart shaped brilliant cut diamond. This is an excellent looking example. It’s got great proportions, not too wide, not too tall. The lobes are nice and round and the cleft is the right size. Symmetry is everything when you’re considering a heart, pear or marquise shape diamond. At just under 1/2 a carat it has good size but it’s quite a bit less expensive than a diamond only a fraction of a carat larger. The clarity is a very strong SI2 that many may call SI1. When we compared it with our GIA certified master stones the colour was determined to be a H. This picture was taken between a GIA master E color and H colour. 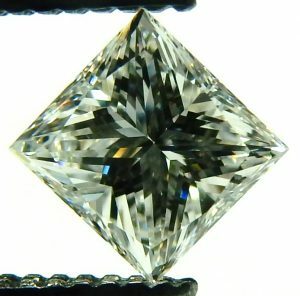 It’s pretty subtle but you can see the very slight tint of colour matches the H colour of the right stone better than the colourless E. With measurements of 4.90mm x 5.15mm x 3.13mmm this diamond could be used as a centre stone for a most unique engagement ring or pendant perhaps. Whatever you decide to set it in our team of talented designer goldsmiths have the necessary talent to turn any design into reality. If you don’t see the estate diamond you are looking for, give us a call. We have 100s of other estate diamonds in stock. You can also visit our online database that shows 1000s of GIA certified diamonds with pricing in Canadian dollars. 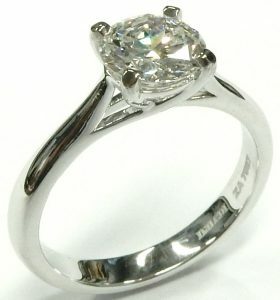 This diamond is estate priced at just $799.00 CAD. 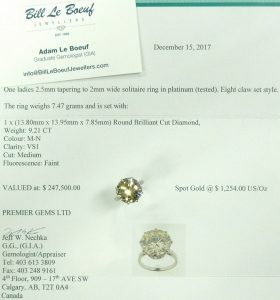 On February 14 2017 the diamond was set in a Bill Le Boeuf Jewellers custom made platinum setting and is no longer available as a just loose stone. 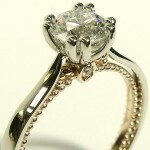 Complete ring is priced at $3200.00 and can also be seen here. Stock #e10098. 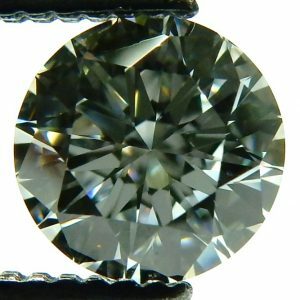 You simply will not find a bigger diamond of this quality for anywhere near this kind of value. 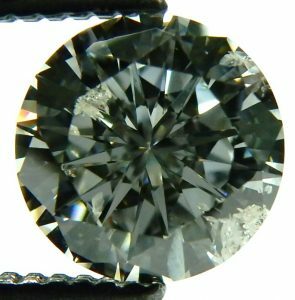 It’s not your typical round brilliant cut either, it’s an antique old mine cut diamond. This diamond was cut centuries ago, possibly close to 300 years ago. Old mine cut diamonds were the standard cut from the early 1700s to the end of the 1800s. Antique and vintage jewellery are particularly popular today; most contemporary styles owe much or at least some of their design inspiration to Art Deco and Art Nouveau designs from 100 years ago. Imagine what you could do with a genuine antique diamond of the size and quality of this one in a custom made piece built just for you. The diamond just returned from the Gemological Institute of America (February 2019) with a full certification of quality along with a unique laser inscription on the girdle edge. The complete GIA document can be seen online here. 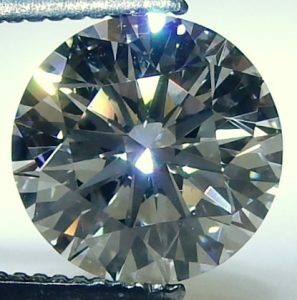 The clarity of SI1 makes the diamond appear completely flawless from a naked perspective and the J colour is very good for a diamond that is likely 200 years old. Old Mine cut diamonds almost always came from the “old mines” of Brazil and India. Stones from these historic locations often produced colour grades in JKLM range. Before the emergence of major diamond sources in Africa in the later 1800s diamonds were extremely rare and only the extremely wealthy could even afford a small one. 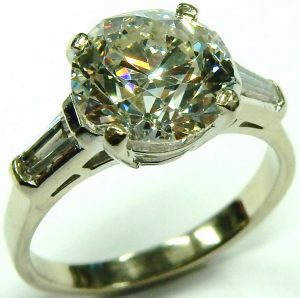 If you’ve been looking for an antique diamond of good size and quality without breaking the bank this could be the one. 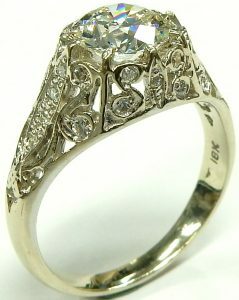 Bring in your ideas and let’s create an amazing tribute to the vintage/antique ring of your dreams. The tiny table facet of just 50%, tall crown with steep crown angle, will give you an optical experience like no modern brilliant cut diamond can. Big chunky facet reflections with an abundance of dispersion are what these stones do better than anything. Believe me; the old diamond cutters from centuries past knew a lot more about optics than we give them credit for. This diamond would be very difficult to replace at any price. Wholesale inquiries are welcomed. Estate priced at $9,000.00 CAD. Stock #e11963. 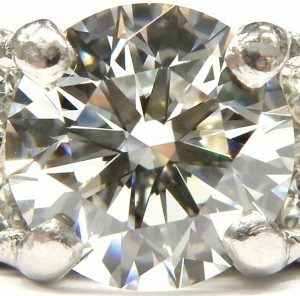 At only $2,970.00 CAD for this GIA ceritified 0.86ct. SI2-F round brilliant cut diamond we could sell this diamond into the wholesale market in New York, Antwerp or India but that isn’t really part of the Bill Le Boeuf Jewellers DNA. For over 60 years we’ve been Barrie’s and areas hometown jeweller. Our unique experience buying selling estate jewellery and diamonds allows us the ability to not only offer better value than any other retailer we can often out wholesale even the wholesalers. Our newest estate diamond was just certified at the Gemological Institute of America February 13 2019. The full GIA report call be seen online here. 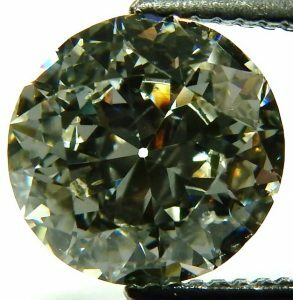 Offering a strong SI2 clairty, F colour GIA certified round diamond for under $3,000.00 is something few vendors are able to do. We’d love this diamond to go to one of our local clients or even to someone who has found us and our products online. 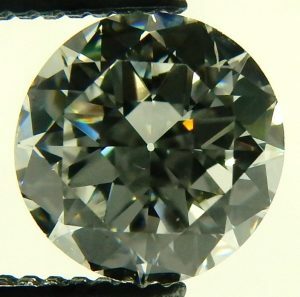 The small semitransparent inclusion is a very interesting and a unique feature of the diamond. The inclusion is easy to resolve in these photomicrographs we took in dark field lighting through our microscope. Its outline looks like one of those 3 dimensional cubes we all use to draw when we were bored in class. 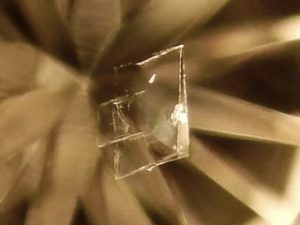 The cubic outline makes sense given diamonds grow in the cubic crystal system. To a naked eye the inclusion all but disappears in the brilliance and dispersion. Only under extreme scrutiny and only by the extremely sharp sighted can it be seen at all. 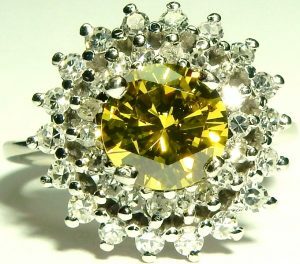 Let’s custom make something completely unique for you with this bright and lively diamond as the centrepiece. Estate price $2,970.00 CAD. Stock #e12002. This would make a great starting point for an affordable solitaire pendant, ring or even for the first side for a pair of diamond earrings. We would have plenty of matching diamonds for the other earring. This diamond measures 4.25mm x 2.50mm and weighs 0.29 carat. The clarity is a pleasant I1; certainly not flawless but quite bright and sparkly. The colour grade is a very nice H and the cut is good. It comes with a Gem Scan certificate of evaluation from September 2000. You’d have a hard time finding another Canadian diamond that offers the sort of value this one does. Perfect condition and estate priced at only $300.00 CAD. Stock #e11910. We were so tempted to call this diamond a SI2 as it’s virtually eye clean. The small translucent white feather inclusion is located in the top right section of the stone. At certain angles it all but disappears. In regular viewing situations it is eye clean, only when viewed through our microscope in dark field lighting does the dark background contrast help resolve this phantom inclusion. We’ve adjusted the brightness, shadows, highlights and contrast in this photomicrograph to highlight the grade setting characteristic. Bill Le Boeuf Jewellers diamonds just look better. We are very tough graders and pride ourselves in the standards we strive to live up to. All of our certified diamond graders have been trained by the Gemological Institute of America. The GIA is the industry standard when it comes to unbiased certification. GIA do not appraise diamonds or jewellery and have no direct interest in the commerce of diamonds or jewellery. Our newest estate diamond is a great value when considering the conservative I1 clarity grade and the fact it is a marquise shape. Marquise shaped diamonds cost 30% less than round brilliant cut diamonds of the same quality. The added length of this shape also makes then appear larger. 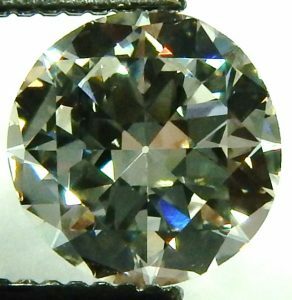 The colour of this diamond has been graded a G when compared to our GIA master stones. Measurements of 8.13mm x 4.56mm x 3.10mm will have people thinking this diamond is much heavier than 0.70 carats. Let us make something extraordinary with this diamond. I can imagine a fantastic pendant with this one as the centre piece. Estate priced at just $1,400.00 CAD. Stock #e11940. 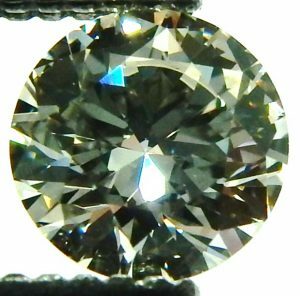 Despite this diamonds modest quality on paper if faces up better than many I1 clarity diamonds I’ve seen that are hazy and dull. This one is bright and lively defying its I2 clarity grade. 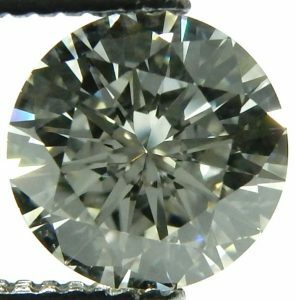 The grade setting inclusions are predominantly located around the outside leaving the centre mostly eye clean and transparent. With an average diameter of just under 6.75mm this diamond looks waaaaay bigger than the average 1.00 carat diamond you’re going to encounter. Larger size, better looking, accurately documented with the world’s most respected certificate and less expensive than the competition equals value only Bill Le Boeuf Jewellers can offer. 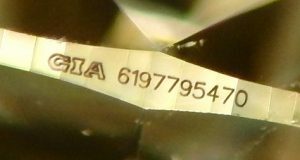 This diamond is likely around 3 billion years old yet the GIA certificate was just issued January 25 2019. I suppose we could have sold this diamond as brand new an no one would be the wiser but we love reusing estate diamonds and jewellery. Our estate diamonds are environmentally friendly as no new earth was disturbed obtaining these natural treasures; your pocket book will love the unsurpassed value they offer. We don’t mind adding some extra value with a Gemological Institute of America report to many of the estate diamonds we offer. It’s quite an ordeal for us to send a diamond to New York for quality assessment and it’s also very expensive. 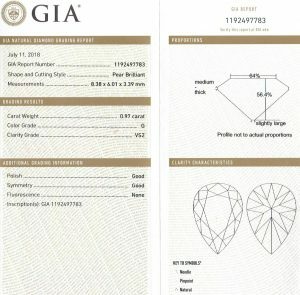 The GIA certificate cost $120.00 USD plus 2 way shipping/insurance costs, not to mention the hassles associated with exporting/importing loose diamonds across the U.S. border. GIA offer no wholesale trade discount; you’d pay exactly what we pay. We feel a GIA report is worth the effort and you should too. Our customers deserve a proper certificate of quality, not a bias insurance appraisal with an inflated price attached as is so common in the jewellery industry. We also spend a little more money getting the girdle laser engraved with the GIA certificate number. This way should you ever loose the original report you can easily retrieve the information online from GIA’s website. 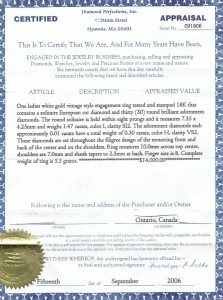 There’s not a report, certificate or appraisal available in Canada that has the international reputation of The Gemological Institute of America for accurate, impartial opinions of quality. 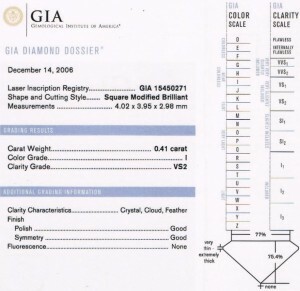 ALL important diamonds come with GIA paperwork. If the diamond you are considering lacks this documentation, buyer beware. Make sure you get a rock solid refund policy if the diamond doesn’t live up to its claim. The more I look at this diamond and consider the weak Canadian dollar, I can’t believe it’s still less than $3,000.00 including the GIA certificate. This isn’t a sales pitch, we really get excited about being able to offer such great value to our customers. Come in and see just how nice this diamond is. Estate priced at $2,980.00 CAD. Stock #e11954. It’s the benchmark size and it hits a very popular price point. 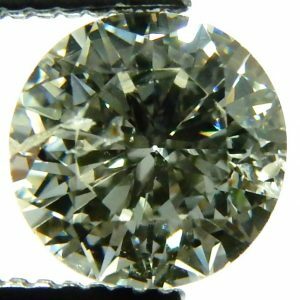 Finding a great looking, excellent cut 1.00 carat round diamond for under $5,000.00 can be challenging. The grading setting inclusions in our latest estate diamond are predominantly twinning wisps. 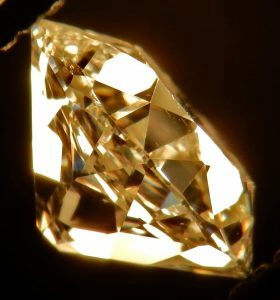 This type of inclusion is typically translucent and does little to obstruct light flow within a diamond. Being almost transparent they are quite often invisible without magnification. The twinning wisps in our latest estate diamond are mostly located outside the large table facet leaving the centre section quite clean. The GIA report was issued January 25 2019 and plots out the wisps on this certification. You can also see a copy of the report on the Gemological Institute of America website. The document also reports on every characteristic needed to determine the overall quality. Stong I1 clarity, very good H colour, excellent cut, very good polish, excellent symmetry and no fluorescence. 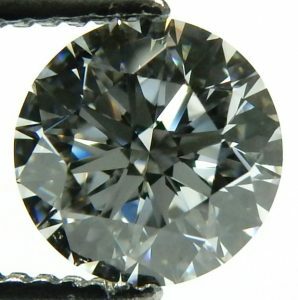 Not all I1 diamonds are created equal, this one is a practically “eye clean”, meaning without artificial magnification it looks inclusion free. There are no black crystals or large white feathers. 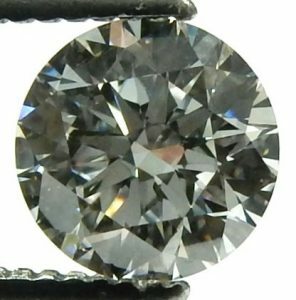 Many 1.00 carat diamonds at this price point have obvious blemishes that can easily be seen without magnification. We are proud of our diamonds and the value they offer. We encourage you to compare our diamonds with any others available. You can even buy ours and compare it with one at another vendor. If you feel ours doesn’t offer the best value we’ll happily take it back for a full refund. This diamond would make a great starting point for your partners dream engagement ring. Bring us your idea and we can create the perfect ring just for you. This diamond is estate priced at $4,890.00 CAD. Stock #e11958. 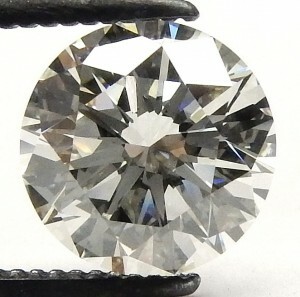 The round brilliant cut is by far the most popular and also the most expensive shape. 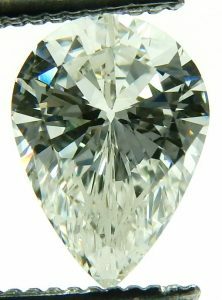 Princess cuts are the second most called for shape; Cushion, heart, oval, pear, marquise and radiant cut are other less common variations of the 57 facet brilliant cut. I don’t know why this shape (the radiant cut) isn’t more admired. When well cut their brilliance and dispersion rivals that of the benchmark round. They look great in many of todays antique inspired designs. They’re far more rare only representing about 5% of the diamonds available from our diamond search database. Of those available only a tiny fraction are nice and square like this one that measures 7.94mm x 7.87mm. Just back from the Gemological Institute of America with a great certified quality of SI1 clarity and H colour. The full GIA report can be seen online here. This example looks especially good because the centre table section is 100% free from any imperfection, only a few thin white feathers can be seen with strong magnification around the edges. Bring us your vision of the ideal piece of jewellery and let us create something spectacular for you. Estate priced at $34,970.00 CAD. Stock #e9834. This is the least expensive way to get a 1.00 carat diamond. 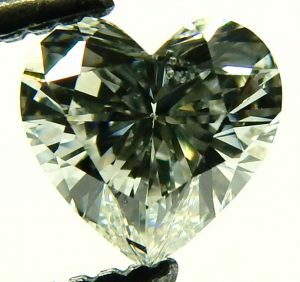 All fancy shaped diamonds are significantly less expensive than a round equivalent and heart shapes are the least expensive of all. An estate heart shaped diamond makes the value better still. 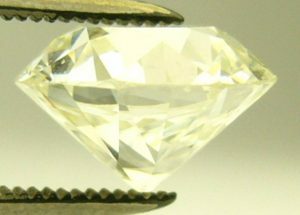 Our example is a strong I1 clarity that is virtually “eye clean” with only a small white feather within the table and some crystal inclusions close to the edges. The nice “I” colour was determined by using our GIA master colour comparison diamonds. Measuring 5.71mm x 7.43mm x 3.46mm this diamond puts down a nice sized footprint. Ready to be assembled into a jewellery item of your choice. It could easily be used in a ring or a pendant. Estate priced at $1,980.00 CAD. Stock #e3117. Looking for a no compromise diamond at a wholesale price? Try one of our estate diamonds. Our estate diamonds offer the type of value others can’t afford to compete with. 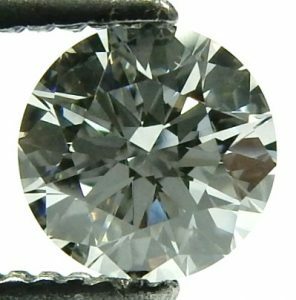 This 0.48 carat round brilliant cut came to us as a chipped 0.58 carat with excellent clarity and colour but only average cut. After our master diamond cutter re-manufactured the stone, he eliminated the chip with 17% loss of weight. What it lost in weight it more than made up for in beauty. It now is cut to excellent standards as this report details. What didn’t change was the outstanding VVS2 clarity, F colour (as compared to our Gemological Institute of America master diamonds) and no fluorescence. 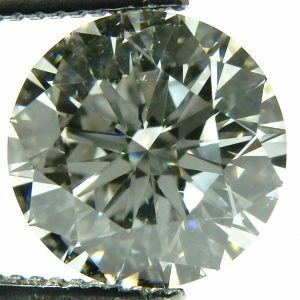 At just under 0.50 carat there is a nice discount to be realized yet the diameter of 5.05-5.08mm is actually more than many average to good cut 1/2 carat round diamonds. Let us create something fabulous for you using this little ball of fire as the centre piece. Dealer purchases are welcomed. Estate priced at $1,600.00 CAD. Stock #e11661. When only the best will do we’ve got a diamond worthy of consideration. Every possible box has been checked off with this one. 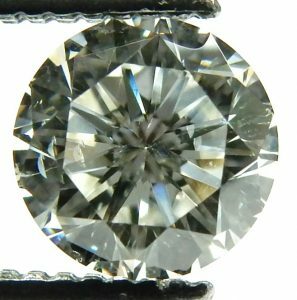 Sure you could buy a nice looking 1 carat round brilliant cut diamond for the same or maybe even a little less than this one, but it wouldn’t be anywhere near the quality. Internally flawless diamonds are exceptionally rare, finding one with a perfect D colour takes the rarity one step further. No fluorescence is the final desirable characteristic that mother nature contributed when this 100% natural diamond formed around 3 billion years ago. The triple X refers to the human element in the fashioning of the rough diamond crystal to the finished stone you see here. 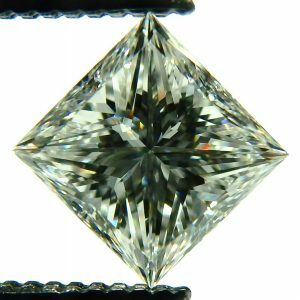 Excellent overall cut, excellent symmetry and excellent polish help bring out the remarkable display of optical fireworks that make diamonds so beautiful. Our in store diamond database contains around 300,000 high quality diamonds but only around 300 are of this size or larger and of the same quality. 1 in 1000 doesn’t express the odds of finding a diamond this good, this quality is very rare. 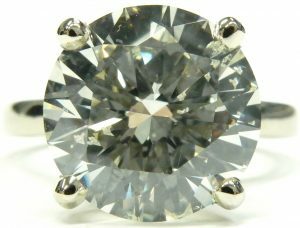 Stores like Birks, Tiffany, Cartier don’t typically stock this quality of diamond, normally we don’t either. When the opportunity to obtain an amazing estate diamond like this presented itself at a reasonable price we couldn’t help ourselves. The full Gemological Institute of America report can be seen online here. Always insist on a GIA report when considering a significant diamond purchase. All certificates use GIA developed grading language but few grade to GIA’s strict standards. 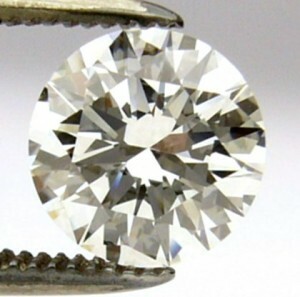 It’s common to see improperly graded and appraised diamonds. We often see diamond certificates that are optimistic when compared to GIA standards by a grade or two. An appraisal/certificate from a GIA trained gemologist doesn’t ensure it has been graded to the standards set by the laboratory, insist on an report only. GIA do not have a Canadian laboratory. The Gemological Institute of American DO NOT appraise diamonds and they are not involved in the commerce of diamonds or jewellery. This allows a completely impartial opinion of quality. If you’re going to spend your hard earned money on a diamond take a few minutes and watch this video by Martin Rapaport discussing over graded diamonds and inaccurate reports. Mr. Rapaport produces a wholesale diamond price list that is widely followed in the industry. This guy knows his stuff. We invite you to shop this diamond around, we think it is the best value anywhere. Let’s create something incredible together to showcase this amazing prehistoric natural creation. This is the only one we have and we can’t get another for the estate price of $6,390.00 CAD. Stock #e11818. Dealer inquiries are welcomed. We love to showcase big diamonds and perhaps we’ve earned a reputation for selling diamonds a little larger than most, but we still rock the more accessible diamonds for the masses. Here’s an amazing example to consider. It’s 0.34 carats of very nice VS2 clarity, “I” colour as compared to our Gemological Institute of America master stones, excellent cut and non fluorescent. While the technical specifications may baffle the average man of the street, the fantastic sparkle and beauty, along with the price of just $590.00 make the appeal universal to all. 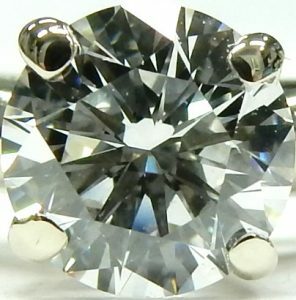 Adding to the attraction is the fact that this diamond is of Canadian origin; complete with a unique laser engraved logo and serial number on its faceted girdle. We can turn this little piece of prehistoric Canadiana into any piece of jewellery your imagination can dream up. Don’t wait too long because for under $600.00 CAD it won’t last long. Stock #e9879. I’ll admit it, buying a diamond can be a little confusing. How’s a consumer to know what diamond offers the best value when there is so much distracting noise around how they’re sold and promoted. Deceptive 50% off sales are all too common, misleading appraisals with inflated values used as sales tools are unfortunately the norm rather than the exception. We respect our customers far too much to participate in these marketing tactics. We always offer our best pricing on loose diamonds and promote accurately graded diamonds certified by The Gemological Institute of America. GIA certification make it easy to compare who really offers the most for your hard earned money. Our latest estate diamond is easy to compare because it is a “triple X”. Excellent cut, excellent polish, excellent symmetry and no fluorescence. The clarity is a very good VS1 with an almost perfect F colour. 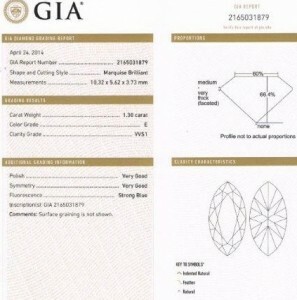 And of course the diamond is GIA certified. Compare this to any and all and I think you’ll agree Bill Le Boeuf Jewellers offers the best in loose diamond value. 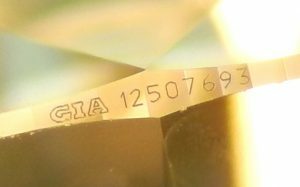 Make sure to ask to see the GIA certificate and laser engraving on any diamond you’re considering. If your jeweller doesn’t sell GIA certified diamonds you should ask yourself why not. Including the GIA dossier report (available online) this diamond is estate priced at $5,100.00 CAD. Stock #e11615. Diamonds are not really that rare, but high quality, excellent cut, good sized diamonds are. Finding a diamond just under 1.00 carat that’s been GIA certified excellent cut is exceedingly rare. Checking our 1/4 million diamond dealer database shows that only 67 other round diamonds weighing 0.98ct. 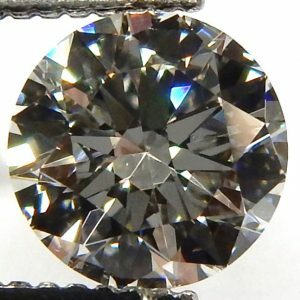 to 0.99ct. are excellent cut. By comparison there are over 7,338 diamonds available weighing 1.00ct. to 1.01ct. of very good to excellent cut. What does this seemingly obscure statistic tell us; diamond cutters major concern is retaining as much weight as possible from a given piece of rough. The majority of consumers simply want a 1.00 carat and pay little regard to the quality of cut, instead of considering an excellent cut sub 1.00 carat that likely costs more but looks way better. This is a shame because many average to good cut 1.00 carat diamonds have diameters of only around 6.20mm and don’t sparkle as much as they could. Our excellent cut 0.98 carat has a diameter of 6.55mm making it look much larger than almost every other 1.00 carat you’re likely to see. The quality of cut is a major factor determining the sparkle and beauty of a diamond. The November 2018 Gemological Institute of America certificate for this beautiful estate diamond can be seen online here. 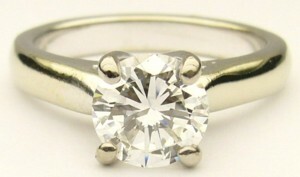 We currently have the diamond set in a simple platinum 4 prong solitaire. 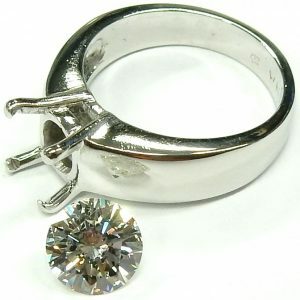 The small size 4 ring weighs an impressive 7.4 grams (without diamond). 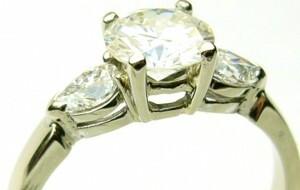 The ring is available separately for an additional $500.00 plus sizing. As always we encourage our clients to shop around and compare the value we offer to anyone (especially on a day like black Friday). If you’re looking to purchase an important and significant diamond make 100% sure it comes GIA certified. A report or appraisal from a GIA trained gemologist is not the same. INSIST only on a seeing an original GIA certificate. 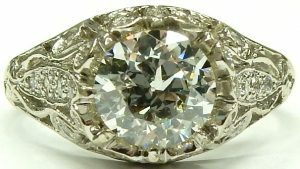 Diamond alone is estate priced at $5,500.00 or complete ring for $6,000.00 CAD. Wholesale vendor inquiries are always welcome. Stock #e11745. Those who truly know diamonds and jewellery have ever accused Bill Le Boeuf Jewellers of being expensive. Our 60 years experience, unique business and operational advantages allow us the enviable position of being able to offer better value than anyone. We don’t take this statement lightly, we really mean it. From big box store to large retail chains and even the latest greatest online vendor. We’re not afraid to compete with any and all competition. We’ve priced our latest estate diamond with 18 karat white gold diamond ring below it’s wholesale replacement cost. This diamond is also currently listed on our wholesale dealer only database for the same price as you see here, so don’t think about it for too long. The price is less than any equivalent GIA certified diamond anywhere! We sell wholesale and we sell retail, it’s all the same to us. We love connecting people with amazing value whether it’s a wholesale colleague or our own retail client. The diamond was just certified by the GIA (November 5 2018) 1.02 carat, VS1 clarity, F colour, very good cut, excellent polish, excellent symmetry and no fluorescence. The full report can be seen on The Gemological Institute of America website here. A great feature of this diamond is its generous 6.44mm diameter. 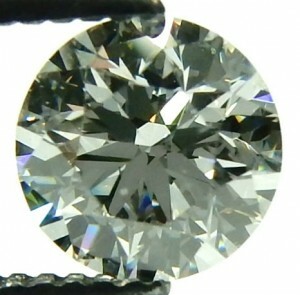 Many 1.00 carat round diamonds of very good cut have diameters only 6.2 to 6.3mm. It many not sound like much but you’d easily notice that 0.2mm difference when compared side by side. At only $8,000.00 CAD we believe this diamond is the best price in the world. If you like the simple 3.6 gram, size 6 1/2, 18 karat white gold setting with 18 small accent diamonds running down the shoulders, it’s available for just $630.00 more. The shoulder diamonds match the centre diamond displaying an average quality of SI1-F. Included with purchase is the full GIA grading report along with a 2015 insurance appraisal assigning a rather optimistic opinion of $22,000.00 retail replacement value. The complete estate ring is priced at $8,630.00. 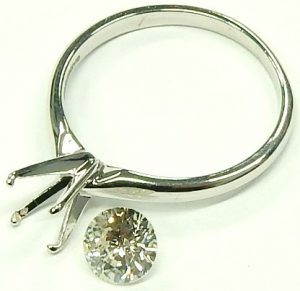 If you have a different setting in mind the centre diamond is available for only $8,000.00 CAD. Wholesale dealer inquiries are welcome. Stock #e11741. This just could be the perfect diamond for someone like you. Sure everyone would love a GIA certified diamond with all the boxes checked off; flawless clarity, D colour, excellent cut, excellent symmetry, excellent polish and no fluorescence. The problem is exceptional quality comes at a huge price. For example; a GIA certified 1.00 carat round diamond of absolute perfection will cost you well over $20,000.00 CAD at current exchange rates. If you want a perfect diamond the same size as this estate 5.01 carat expect to pay around $750,000.00 CAD. That’s right 3/4 of a million dollars (assuming you can find one). It’s not just the 4Cs of clarity, colour, cut and carat weight to consider when buying a diamond; there’s a 5th C. The “cost” is the 5th C that everyone needs to contemplate. Whether it’s a thousand dollars or one million dollars everyone wants to get the most bang for the buck plus outstanding value. That’s why I like this diamond so much, it offers a great big look and amazing value. 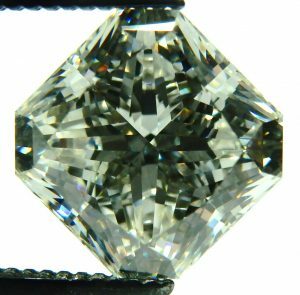 It’s got the size at over 5 carats with an average diameter of 11.07mm, excellent cut, excellent symmetry, excellent polish and no fluorescence. The clarity of SI2 is 7 grades from flawless but it looks perfect without magnification to anyone except under extreme scrutiny and only from those with exceptional close up vision. The small white crystal inclusions disappear under any typical viewing situation. 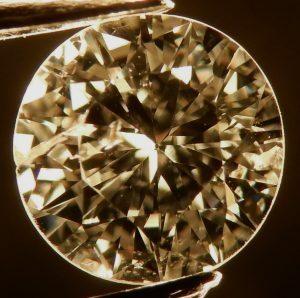 This high resolution, high magnification image reveals the insignificant natural inclusions that have been a part of this diamond since it formed billions of years ago. As a Gemological Institute of America trained Gemologist with over 25 years experience I can say with confidence this is a really nice SI2 (closer to a SI1 than an I1). The colour grade of K is ever so slightly warm but it faces up amazing with the sort of sparkle and dispersion you’d demand from a 5 carat diamond. The K colour is very strong when compared to other GIA certified Ks we have in stock. It must have missed a J colour designation by the slimmest of margins. This diamond was recently certified (July 2017) by GIA. The full report can be seen online here. While $60,000.00 CAD isn’t a small sum of money, if you’ve ever considered a significant diamond this one is likely the best value currently on the market. 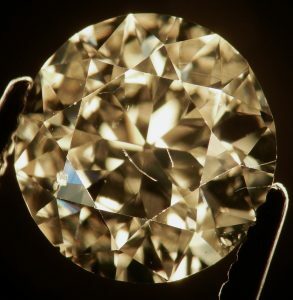 Finding large diamonds with particularly desirable quality characteristics are few and far between. Few jewellers have this size of diamond in stock. 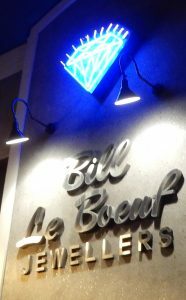 We are your diamond destination at Bill Le Boeuf Jewellers. We have the inventory and we’re confident of the fantastic value. We always display upfront pricing in Canadian dollars and the information necessary for our clients to comparison shop. Even if owning something like this isn’t in the cards right now, please come in and have a look. Or if you love diamonds the way we love diamonds and just want to see what a nice 5 carat looks like, come on in and check it out. This one is estate priced at $59,800.00 CAD. The diamond is currently set in a brand new, 3.7 gram, American made 14 karat white gold solitaire setting included for no additional charge. Stock #e10670. There’s a market for identical products at many different price points. An informed customer can do a bit of homework and quickly find out it would be virtually impossible to find better value in a diamond than one of our estate items. 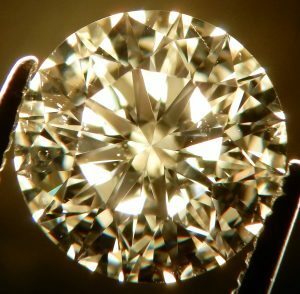 Most of the retail world rely on the fact that the majority of people haven’t a clue as to what something as mysterious as a diamond should cost. After being in business for close to 60 years we’ve come to realize we’ll simply never be able to connect with everyone. If you’re an existing Bill Le Boeuf Jewellers customer, thank you. If you are discovering us for the first time congratulations; you have found a jeweller that has earned our community’s trust and respects our customers like no other. You won’t find big discount sales and dodgy marketing schemes around here. We’re all about the absolute best value all of the time. If you don’t know jewellery, know your jeweller. 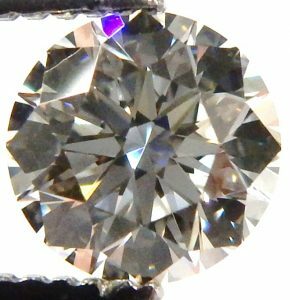 Our latest featured diamond is a beautiful round brilliant cut 0.53 carat of almost perfect VVS clarity and E colour, with an excellent cut and no fluorescence. The GIA certified diamond is currently secured in a simple 4 prong solitaire weighing 2.6 grams available separately for just $100.00. The Full Gemological Institute of America report can be seen online here. The size 7 1/4 ring is showing some wear on the claws and could use a little laser welding to fill in a couple tiny casting pits. We can accomplish these minor tasks for the new owner if they wish. The diamond is available by itself if you have other plans for just $2525.00. Complete ring is priced at only $2625.00 CAD. Now that’s great value, do some homework and you’ll agree. No one does “I do” like we do. Stock #e11654. Not all SI2s are created equal and neither are all diamond certificates. 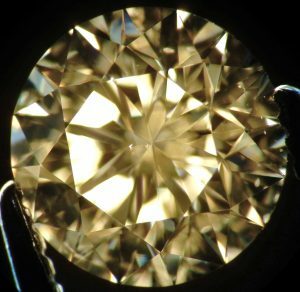 Diamond appraisals and certificate use common diamond grading language but not all grade to the same industry standards. All too often we see diamond and jewellery appraisals with optimistic flattering opinions that might make you feel good but don’t tell the true story. A third party unbiased opinion is what every diamond consumer should insist on. The Gemological Institute of America is the impartial industry judge for anyone looking for an accurate opinion on diamonds and gems. They have no interest in the commerce of jewellery and they offer no wholesale discounts to anyone for their services. They don’t assign value to any piece of jewellery. Anything submitted to their labs must be done so without any existing description of quality. This beautiful estate diamond returned from GIA with a SI2 clarity grade and very good G colour grade. This SI2 is so much better than many SI2s we encounter from other certificate providers. A small white feather at 9:00 o’clock is invisible to all but the most sharp sighted at extremely close range. Some twinning wisps running across the stone are completely invisible without magnification. The full August 2018 GIA report can be seen online here. This diamond is going to make a great starting point for an amazing ring, pendant or perhaps half a pair of earrings. It’s a blank canvas waiting for us to set into any of our production items or perhaps a unique one of a kind custom piece. It’s a fantastic diamond and an incredible value for the estate price of only $2040.00 CAD. Stock #e11556. Round brilliant cut diamonds have always been the most popular shape. From a strictly scientific perspective they are the most effective when it comes to optical efficiency. When cut to perfect proportions they return more light to the observer in the form of brilliance and dispersion than any other shape. The trouble is few round diamonds are cut to excellent or ideal proportions. Many manufacturers opt to trade off a superior cut for a psychological advantage in the form of maintaining some extra weight. Fancy shaped diamonds offer an interesting alternative to rounds. Often they look larger compared to the same weight of a round diamond due some extra length. 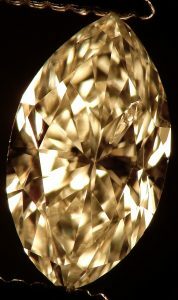 Marquise, pear and oval almost always appear larger than an equal weight round diamond. This particular diamond puts down a large footprint of 8.38mm x 6.01mm. 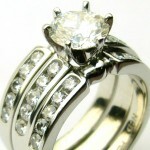 The illusion of a bigger stone combined with less cost are reason enough to check out a fancy shape. 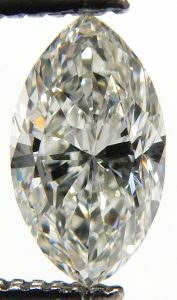 Compared to the same weight excellent cut round diamond this pear shape costs about 25% less. 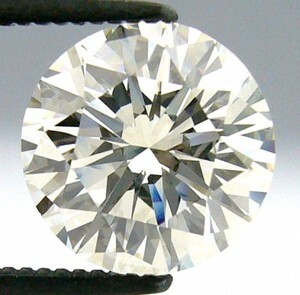 Its estate nature extends that discount over a new round diamond closer to 50%. We just had this diamond certified at the Gemological Institute of America in July 2016. While I suppose we could sell it into the wholesale or retail market as a freshly mined/certified diamond, we’d prefer to sell it as the true previously enjoyed/estate diamond it is. The full GIA report can be seen online here. If you’re considering a significant diamond purchase insist on a full GIA report to be sure you’re getting what you’re paying for. Any jeweller confident in the quality their diamonds usually sells or endorses GIA certified diamonds. Reuse and recycle. Everyone should consider buying an estate diamond and consider a fancy shaped alternative. They’re out of the ordinary, they are less expensive and they open up many new design options. As with all diamonds, when they are of good quality and well cut they sparkle and twinkle like fireworks. With a VS2 clarity grade and G colour the quality is better than most by a good margin. Nice proportions, good polish, good symmetry and no fluorescence guarantee an amazing display on that custom piece of jewellery that’s been on your mind. Including the full GIA grading report this estate diamond is priced at $4600.00 CAD. Stock #e11543. The DNA of Bill Le Boeuf Jewellers has always been about supplying amazing jewellery values to our retail clients for the last 60 years. What you may not know is we also do some wholesale work to qualified vendors. While it’s easier selling to another retail jeweller we get far more satisfaction when one of our regular customers picks up one of our products. Our latest estate offering just came back from The Gemological Institute of America in New York. We use GIA as an impartial judge to certify many of our larger estate and new diamonds. The full and comprehensive plotted diamond grading report (July 11 2018) can be seen online here. GIA are universally accepted as the authority when it comes to diamond certification. They don’t supply appraisals and they’re not involved in the commerce of diamonds or jewellery. This ensures they are impartial to all, unlike most of the insurance appraisals we encounter. Maybe you should ask yourself; why don’t all jewellers supply GIA reports with their diamonds? 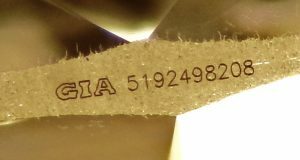 We’ve also spent a little more money having the GIA certificate number laser engraved on the girdle. 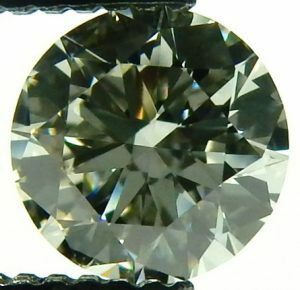 The 0.90 carat diamond has been certified an I1 clairity with a “I” colour and a fair cut. 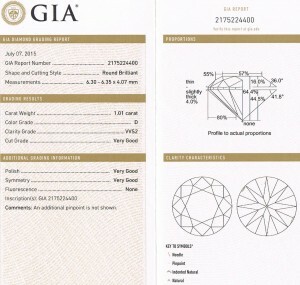 The modest results shown on the GIA document don’t tell you how lovely this diamond is. Just as a description of a beautiful woman can never do her justice. This diamond is bright and full of sparkle. There are a couple of white feather inclusions, a few small crystals and even a tiny cavity. All that being said its large 6.38mm diameter is bigger than many 1.00 carat diamonds and it sparkles remarkably well. 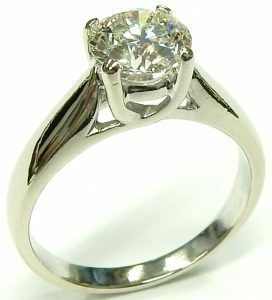 We’ve selected a traditional 14 karat white gold solitaire to efficiently showcase the diamond is a simple 4 prong pedestal. The setting weighs 2.7 grams and measures a slightly larger size 9 3/4. One of our onsite goldsmiths can adjust the size as required in just a day or so. If you’re looking for a good sized diamond ring but would rather not spend half a year’s mortgage payments doing it, have a look at this one. I think you’ll be surprised how nice a properly graded I1-I can look. We offer a full money back guarantee if you don’t agree. As always dealer inquires are welcome. In truth we’d rather have it go to someone who will be proud to say, “I got it at Bill Le Boeuf Jewellers”. 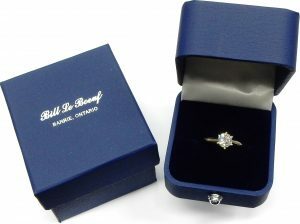 Estate price for the ring and diamond $2280.00 CAD. Stock #e11455. We apologize to all the other jewellers that simply can’t afford to compete with the sort of value our estate diamonds offer. Our latest estate diamond came to us with a minor chip on the culet. We had the chip repaired, overall cut improved then off it went to the Gemological Institute of America for certification. The fresh August 21 2018 report confirmed what we knew all along. We don’t need a piece of paper to appreciate a pretty diamond but a GIA certificate sets the bar when your’re comparing diamonds. If your jeweller doesn’t sell GIA certified diamonds ask them why not? If it’s not a GIA certified diamond you may not be comparing apples to apples. GIA are the industry authority when it comes to unbiased quality evaluation. Practically ALL important diamonds come with GIA certification. 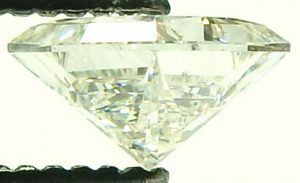 The geometry of this diamond falls just short of excellent cut with a slightly shallow crown angle and crown height. The side affect of a slightly shallow profile gives the diamond a generous 5.9mm diameter making it appear larger than many heavier weight diamonds of only good or fair cut. The full GIA report can be seen online here. 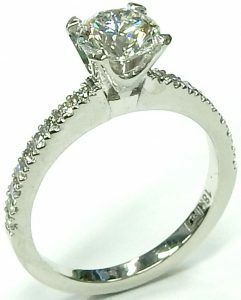 If you’ve got a custom ring in mind this diamond is at the popular price point offering a big look without a huge cost. The VS1 clarity with G colour means you don’t have to be trading off the quality to get a significant size. Finally the estate nature of the diamond allows you to save thousands compared to what a comparable diamond would cost at the mall. Estate priced at $3060.00 CAD. Stock #e11470. 2.00 carat diamonds are the new 1.00 carat. Maybe it’s a sign of our evolving business or the amazing values we offer but we’re getting more calls for bigger diamonds all the time. 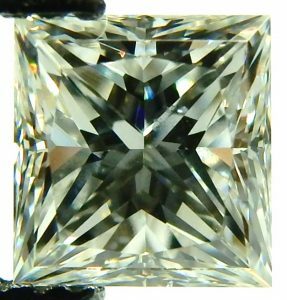 Here is a great opportunity to get a great looking 2 carat estate diamond for a significant discount over the replacement cost. The fully certified Gemological Institute of America diamond faces up very white with a strong “I” colour. The SI2 clarity grade was established due to the presence of twinning wisps. Twinning wisps are a preferred clarity characteristic because they are usually semi transparent or translucent. They typically go unnoticed without artificial magnification. The other pertinent quality characteristics are, very good overall cut, very good polish, very good symmetry and no fluorescence. The full October 2017 GIA report can be seen online here. Always insist on a GIA report if you’re considering a significant diamond purchase. 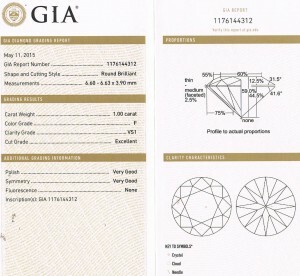 All certificates use GIA developed grading language but many do not grade to GIA’s strict standards. 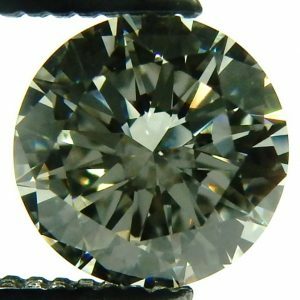 It’s very common to see SI2 graded diamonds that are actually I1 clairty. We also see diamond colour grades that are often optimistic when compared to GIA standards by a grade or two. An appraisal from a GIA trained gemologist still doesn’t ensure it has been graded to the standards of the laboratory. GIA DO NOT appraise diamonds and they are not interested in the commerce of diamonds. This allow a completely impartial opinion of quality. If you’re going to spend well into 5 figures for a diamond take a few minutes and watch this video by Martin Rapaport discussing over graded diamonds and inaccurate reports. Mr. Rapaport produces a wholesale diamond price list that is widely followed in the industry. This guy knows his stuff. Our properly graded estate diamond is currently set in this 14 karat white gold ring. 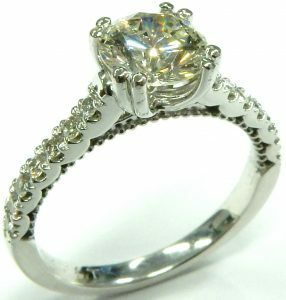 The custom made white gold ring contains 46 additional small diamonds and is available for $1050.00. The diamond alone is estate priced at $15050.00 CAD. Stock #e11559. If you’ve never heard of a transition cut you’re not alone. Transition cut is a term that refers to diamonds from the 1920s into the 1940s. It was a time when the world was changing and technology played a larger role in life including a more scientific understanding of how optical physics related to the brilliance of a diamond. 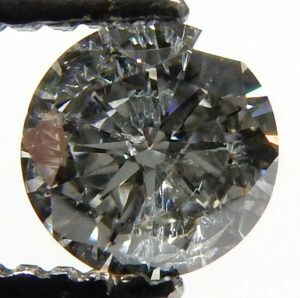 These transition cuts look mostly like old European cut diamonds but have some characteristics of a modern brilliant cut. They’re a bit of a hybrid and we love them. Smaller tables, taller crowns like antique diamonds but with longer lower girdle facets and thinner pavilion main facets approaching that of modern diamonds. They have a unique look with tons of dispersion and are perfect in original antique rings or settings inspired by antique design. This diamond just came back from The Gemological Institute of America with fresh certification of 1.46 carats, SI1 clarity and K colour. The full report can be seen online here. This is a pretty big looking diamond. Its average diameter of 7.43mm is much larger than most 1.50 carat modern diamonds. The diamond came to us in an antique inspired modern manufactured 18 karat white gold filigree ring, bead set with 26 modern round brilliant cut diamonds. The small diamonds are of very good quality averaging VS-SI-HI. The 5.5 gram ring measures a finger size 8 1/4 but can be adjusted down a couple sizes if needed. Included with purchase is the May 11 2018 GIA report along with a September 2006 appraisal from Hyannis Massachusetts jeweller Diamond Perfections Inc. Their idea of replacement value is $14,000.00 USD (including ring). As with most outside appraisals submitted with jewellery we see, the value attached is a little optimistic in our opinion. 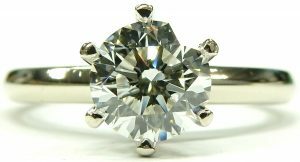 To replace the ring and diamond at a more competitive retail price we feel an appraised value should be closer to $11,650.00 CAD ($9,100.00 USD). The ring and diamond are estate priced at $8155.00 CAD. The diamond is available without the ring for $7000.00. Stock #e11310. Is the diamond you’re looking at GIA certified? If not you better ask yourself, “do I know diamonds or do I know my jeweller?” Truth is, unless your diamond has been truly independently certified you are dealing with a biased opinion. 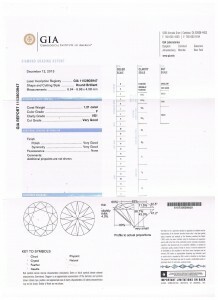 The Gemological Institute of America does not work for anyone, there are no wholesale discounts available to the trade, they DO NOT appraise diamonds, the diamond graders from GIA do not know who submitted the gems they are working on and most of all GIA do not have any commercial interest in the commerce of diamonds. This makes it possible for them to impartially analyze and certify diamonds without outside influence. 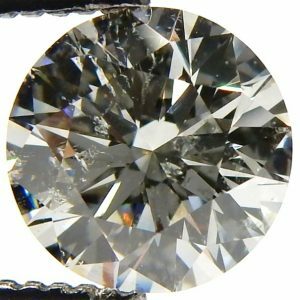 Many diamond appraisal/reports are simply wrong, with prices not reflective of the actual market and grades that are inaccurate. We are living in a time of incredible retail competitiveness as long as you are comparing apples to apples. Make sure the diamond you are considering is GIA certified or the jeweller offers a full refund if it falls short when judged beside a properly documented diamond. Bill Le Boeuf Jewellers guarantee the best value in diamonds, period! Our latest estate diamond was just graded at GIA May 11 2018 and came back with a grade representing amazing bang for the buck. The full report can be seen online here. 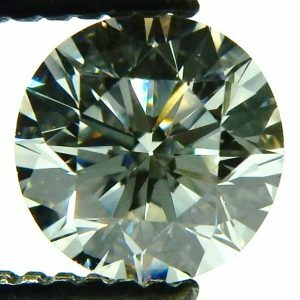 It’s a 1.34 carat round brilliant cut with SI2 clarity, J colour, very good cut, excellent symmetry, excellent polish and no fluorescence. Have a look in the local mall, your specialty jeweller, online, big box store or anywhere else you think would be a good place to buy a diamond. We’re very confident this one offers the best value. First come first serve, wholesale dealer inquiries are welcome. Honestly, you won’t find a better looking diamond for this price. We have it currently set in a 3.9 gram 14 karat white gold Lucida style setting available separately for $238.00. The diamond alone including the full GIA grading certificate is estate priced at $6500.00 CAD. Stock #e11311. You’ve got to be a real diamond enthusiast to recognize the name Lazare Kaplan. I’d imagine even the majority of jewellers have never heard of the Kaplan family. They’ve been master diamond cutters for over 100 years. They were among the first to cut diamonds according to a strict mathematical formula developed using the science of optical physics. This precise blueprint for diamond cutting showcases optimum levels of brilliance and dispersion. Only a tiny fraction of diamonds are cut with this template in mind as it is more time consuming and typically yields a smaller finished diamond from a given rough diamond crystal. I think this is only the 2nd example of a Kaplan diamond we’ve ever had come through our estate department. It weighs 0.58 carats and measures 5.35mm x 3.22mm with a tiny table promoting incredible dispersion. Needless to say the polish and symmetry of these diamonds are as good as it gets too. Despite a slightly warmer K colour as compared to our GIA master diamonds this diamond appears much more white. The slightly yellow tint is almost totally lost in the fireworks. It’s a little ball of fire just waiting for you to set it in a ring or pendant. 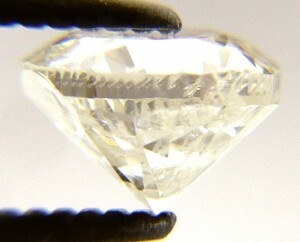 A few small white crystals close to the edge at 3 o’clock qualify this diamond as a SI1 clarity. With strategic claw placement these inclusions could be completely covered making the diamond look more like a VS clarity stone. 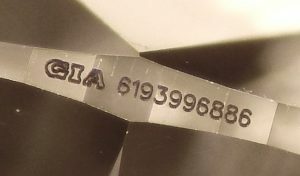 Each Kaplan diamond has been uniquely laser engraved with a registered number. Kaplan were the first company to identify each of their diamonds with laser engraving. To learn a little more about this company have a look at their website. These high end branded diamonds command a much higher price if you were looking for a new one. As an estate trade in diamond we’ve priced it the same as any other ideal cut generic diamond making this one an even better value. We can’t replace it, when it’s gone it’s gone. Estate priced at just $1300.00 CAD. Stock #e11069. Which would you prefer; a 6.67mm diameter 1.03 carat VVS1-G good cut diamond or a 6.25mm 0.91 carat VVS1-G excellent cut diamond? Tough question made even more difficult because both of these diamonds would be the same price in theory. Go for size or go for a perfect cut? That is is the question we had to decide when this diamond recently came in. We opted for leaving the 70 year old vintage diamond its original size rather than re-cutting it to a smaller size but of superior cut. The weight of nicely over one carat and even larger dimensions of 6.57mm – 6.77mm x 3.73mm were the most important factors for us. Truth be told the good cut is really close to very good or even excellent from a purely visual perspective. A slightly shallow 55.9mm depth is better than first appearance because of a small open culet. The bigger table of 67% cuts down slightly on dispersion but actually promotes a bit more brilliance, so that’s a trade off. A slightly out of round circumference of less than 3% is invisible to a naked eye. Sometimes we get too caught up in the small technical details that have very little effect on the overall “sparkle” of a diamond. I’ve always said “pay for what you see”. Obviously the size is easy to see. A pleasing colour and clarity are also easy to appreciate. If it dazzles and dances like a ball of fire the cut is at minimum pretty good. 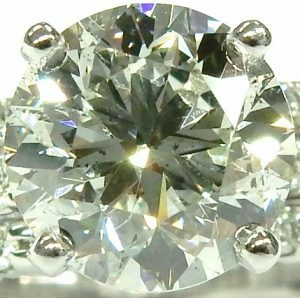 With all this in mind we present this vintage GIA certified 1.03 carat round brilliant cut diamond for an incredible value. It just returned from the Gemological Institute of America (May 30 2017) with the world’s most respected certificate of quality. The full report can be seen online here. If you ever decide to improve the cut to excellent our master diamond cutter can easily deliver a 0.90ct. to 0.93ct. from this diamond. But to us this diamond represents a more appealing option. They’re only original once. We currently have this pretty diamond set in an 18 karat white gold palladium alloy naledi solitaire setting available for $725.00 extra. Estate priced at $7300.00 (diamond only). Inquires from within the trade are welcomed. Stock #e10551. You simply will not find a bigger diamond of this quality for anywhere near this kind of value. 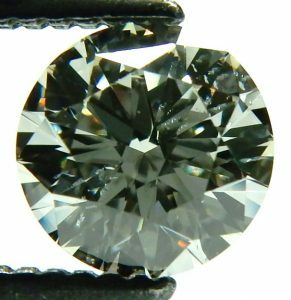 It’s not your typical round brilliant cut either, it’s an antique old mine cut diamond. This diamond was cut centuries ago, possibly close to 300 years ago. Old mine cut diamonds were the standard from the early 1700s to the end of the 1800s. Antique and vintage jewellery are particularly popular today; most contemporary styles owe much or at least some of their design inspiration to Art Deco and Art Nouveau designs from 100 years ago. Imagine what you could do with a genuine antique diamond with the size and quality of this one in a custom made piece build just for you. When we first obtained this diamond it had suffered some past damage in the form of a chipped girdle that extended 1/2 way down the pavilion. Big diamonds in the 1800s tended to be set very low in full bezel settings that protected the extremely thin edges typical of old mine cut diamonds. Modern diamonds have a girdle cut around the entire circumference eliminating the razor sharp edge making them much more difficult to chip. Todays popular prong set styles expose a diamonds edge making a slightly thick girdle edge a necessity protecting against chips. We asked our master diamond cutter to repair the chip and facet the entire circumference creating a thicker girdle. The new and improved repaired diamond only lost a few 1/100ths of a carat in the process. This diamond now represents the best of both worlds; old world charm with modern durability and of course fantastic value that comes with all of Bill Le Boeuf Jewellers new and estate jewellery. The diamond has a nice sized footprint of 6.58mm x 6.10mm x 4.08mm with a confirmed weight of 1.23 carat. Clarity has been graded a solid VS2 with a conservative “I” colour. 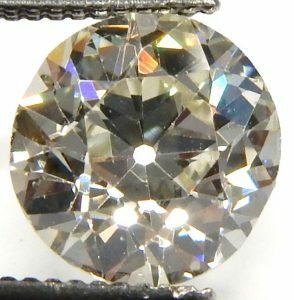 If you’ve been looking for an antique diamond of good size and quality without breaking the bank this could be the one. 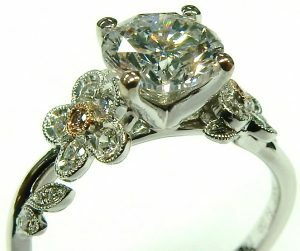 Bring in your ideas and let’s create an amazing tribute to the vintage/antique ring of your dreams. A small table, tall crown with steep crown angle will give you an optical experience like no modern brilliant cut diamond can. Big chunky facet reflections with an abundance of dispersion are what these stones do better than anything. Believe me, these old diamond cutters knew a lot more than we give them credit for. This diamond would be very difficult to replace at any price. It is estate priced at $5500.00 CAD. Stock #e11202. This diamond just came back (May 11 2018) from The Gemological Institute of America in New York a certified VS2 clarity, I colour, very good cut, excellent polish, excellent symmetry and exhibiting faint fluorescence when exposed to long wave ultraviolet light. 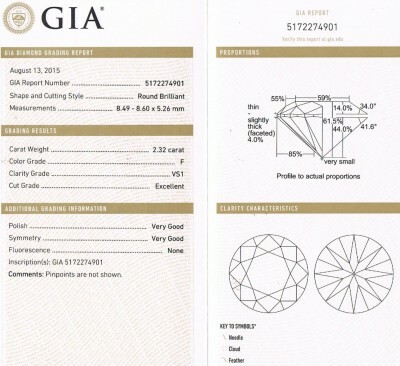 The full GIA diamond grading report can be seen online here. 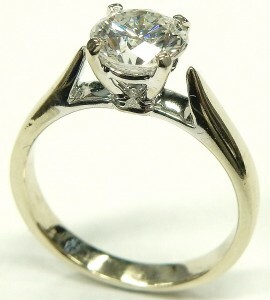 We currently have the diamond set in a simple 6 prong Tiffany style solitaire. 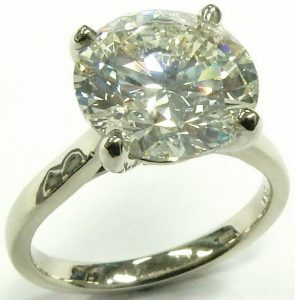 The 3.9 gram, 14 karat white gold ring measures a finger size 7 and is available for an additional $300.00. As always we insist you shop around the competition, do some research and find out for yourself where the best value is. When you’re buying an important diamond, insist on one that comes with a Gemological Institute of America report. If is doesn’t, make sure it is fully refundable in case it isn’t what is represented. Diamond alone is estate priced at $6000.00 CAD. Stock #e11312. You really can’t improve on something that’s ideal. This diamond was cut without regard to the finished weight. The finest cut was the only thing our master diamond cutter was instructed to do when a badly damaged 3.00 carat was submitted for an insurance salvage claim. We missed perhaps the finest opportunity of before and after pictures because I wasn’t sure if even the biggest 0.88 carat fragment of the original 3.00 carat could be cut into anything useful. Have a look at the cut report for this little ball of fire to see what we ended up with. Every single measurable component of cut is absolutely ideal. From table to culet, from crown angle to depth percentages, everything is perfect. All those little IDs mean IDEAL. This little stone is the standard to which all others should be compared when considering cut. SI1- J are good if not exceptional clarity and colour, but when combined with the phenomenal cut you’d think it was a flawless rare white diamond. The price and the sparkle make this diamond a great candidate for a simple pendant or ring for someone who appreciates the art of precise cutting. The fantastic value is pretty compelling too. Estate priced at $590.00 CAD. Stock #e9889. Beautiful diamond. Very good cut, with good symmetry, good polish and medium blue fluorescence. The February 2016 full GIA certificate can be seen here. 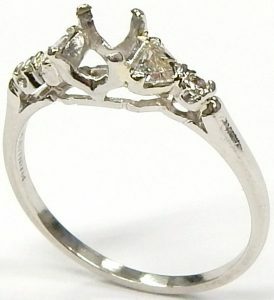 This would be a great starting point for a fantastic engagement ring. Estate priced at $5700.00 CAD Stock #e6471. 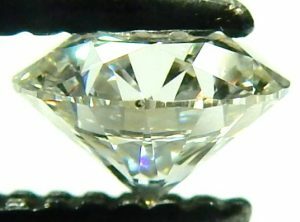 A very well cut half carat diamond measuring 5.15mm x 3.20mm perfect for almost any application in a piece of jewellery. You won’t find better at the estate price of just $1928.00 CAD. Stock #e6128. One excellent looking diamond that I was tempted to call a VS2. In fact it may well be a VS2 but we would always prefer to under promise and over deliver when describing the quality of our diamonds. 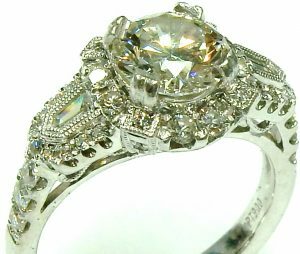 There is one tiny white crystal hidden under an upper girdle facet that could be completely covered by a claw when set in a ring. The G colour is well above average and the cut is very good with measurements of 6.43mm – 6.49mm x 3.85mm. This diamond exhibits no fluorescence as an added bonus. Two small extra facets on pavilion finish this diamonds unique combination of characteristics. Estate priced at $6380.00. Currently in a platinum setting with princess cut diamonds available separately. Stock #e8236. Most diamonds that weigh 1.00 carat usually have a diameter of around 6.2mm. Most diamonds that are cut specifically to weigh exactly 1.00 carat are usually not cut to ideal or excellent standards. There are many diamonds cut to appeal to the person simply looking for a 1.00 carat diamond rather than the sophisticated customer who appreciates a fine cut rather than just a heavy stone. After all what good is a 1.00 carat diamond that doesn’t sparkle because of an inferior cut. Our latest estate ring not only has an excellent cut, it also weighs nicely over 1.00 carat at 1.09. Because it’s cut to excellent standards the diameter is much bigger than the average to good cut stone. At over 6.6mm average diameter this one looks pretty big, especially when we are showing it in this flattering a split claw setting. A solid “eye clean” SI2 clarity grade means the small white feather located at the 3:00 o’clock position in the top photo can only be resolved with magnification. According to our Gemological Institute of America certified master stones the colour is a J. With its superior cut the J colour looks more like an H. Cut is so important to how a diamond sparkles. 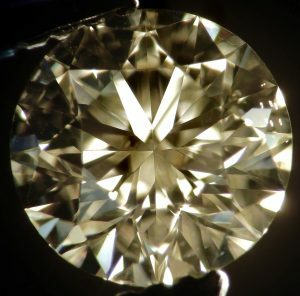 Without a nice cut, the unique optical properties of a diamond can’t be appreciated as it will appear lifeless and dull instead of like a little ball of fire. 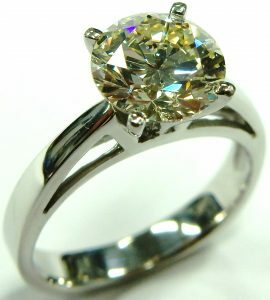 This beautiful estate diamond is available for just $4460.00 CAD. Stock #10870. If you’d like it as shown, the brand new Canadian made setting costs an additional $1000.00. The 3.0 gram, 14 karat white gold setting contains 14 small diamonds of SI-GH quality. Like pretty much everything in this world, diamonds are priced in United States dollars then converted to your local currency when you purchase them. When Bill Le Boeuf Jewellers purchases new diamonds from New York, India, Israel etc. the vendors don’t want to be paid in Canadian dollars, Indian rupee or the Israel shekel. Diamond dealers only accept United States Dollars. That’s all fine as long as you have USD to pay for them. If you don’t, the U.S. cash is going to cost you a few percent due to bank currency exchange rates. The great thing about our estate diamonds is they are usually from Canada, we buy them with Canadian dollars and sell them in Canadian dollars. It may not sound too important but saving a few percent on a diamond purchase makes a noticeable difference. At one point or another all retailers lose a couple percent buying U.S. dollars then lose a couple more selling Canadian dollars in order to buy more USD so they can buy more diamonds from foreign suppliers. It’s a vicious circle that our estate inventory is thankfully not part of, making us extra competitive (let’s just keep it our little secret). This 1.24 carat diamond was traded in from a recently married young couple who inherited it. At this point in their lives a big diamond really wasn’t what they needed. We were happy to help them out and they were happy to pay off some debt. We submitted the pretty diamond to GIA in New York for certification. Almost every important diamond in the world comes with a Gemological Institute of America report. If the diamond you’re considering doesn’t come with a GIA report be extra careful and ask why not? The May 2016 report came back as expected with very good results of 1.24 carats, VS1 clarity, J colour and a very good cut. The full GIA document can be see online here. That’s the beauty of an estate diamond; they are usually bigger, usually better and ALWAYS less expensive. This diamond sets the benchmark in value at just $6600.00 CAD. This diamond is currently set in a Canadian made 10.5 gram, 14 karat white gold engagement/wedding ring set containing 0.20 carats of additional small diamonds. The two rings are available for $1200.00 extra. Stock #e10672. 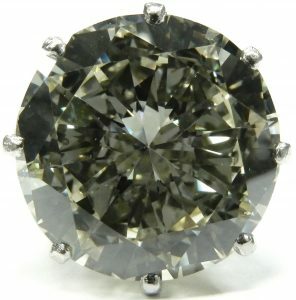 You can get a really good looking diamond of significant size for not too much over $2000.00. 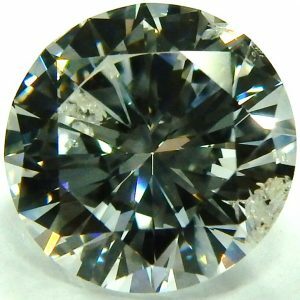 This very good cut 0.61 carat round brilliant is proof of that. Buying a diamond is much the same as anything else in this world. It comes down to wants, concessions and budget. Every one wants a huge flawless diamond, perfect in every way, however life’s other commitments and responsibilities limit what the average person can do. This diamond faces up pretty big with the larger than average diameter (for a 0.61 carat diamond) of 5.56mm. The smallish 58% table, with an almost perfect 33 degree crown angle ensure plenty of dispersion and brilliance. A nice colour grade of G as compared to our GIA certified master diamond is almost as good as it gets. A cautious VS2 clarity grade means this diamond has perfect clarity to the naked eye. As an added bonus it also shows no fluorescence when exposed to long wave ultra violet light. While not a true ideal or excellent cut by the strictest of standards, it shows a reasonable hearts and arrows pattern when viewed through polarized light. Lets do something great with this diamond. Something unique and fabulous for that special person in your life. Shop this diamond around, compare the specifications. Once you’ve compared what the competition has to offer I’m sure you agree, Bill Le Boeuf Jewellers offers the most value when it comes to diamonds and estate jewellery. Dealer enquires are always welcome. Estate priced at $2200.00 CAD. Stock #e10806. It not the biggest, it’s not the most expensive but it’s one of the few certified internally flawless diamonds that we have. Even the polish has been determined by The Gemological Institute of America as excellent. 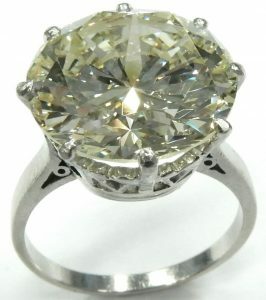 The just over half carat size and J colour keep this stone attainable by many. 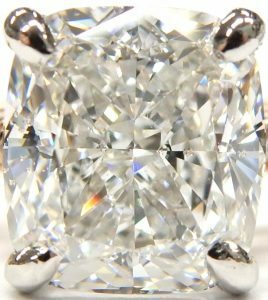 Just to compare, a GIA certified 1.00 carat flawless clarity, D colour diamond with excellent cut, polish, symmetry and no fluorescence is selling for over $25000.00 CAD right now. The June 2016 GIA certificate is available to view online here. Less than 1% of diamonds currently available from our database are this good or better. For the estate price of just $1500.00 CAD this is likely the best value anywhere (seriously). Stock #e9749. People will say that diamonds are not rare. Well, that may be true if your speaking about the average quality small round diamond but when it comes to high quality, larger sized, fancy shaped diamonds they really are quite rare. Our in store database contains over 400000 loose diamonds from cutting factories and vendors and all over the world. 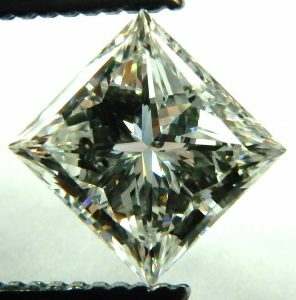 When we filtered out the average clarity, average colour, smaller examples, there were fewer than 100 princess cut diamonds of the same or better quality and bigger than this example. Once we searched for one as well cut as this there wasn’t a single comparable stone making this diamond practically one of a kind. This diamond just returned from the Gemological Institute of America with excellent results of VVS2-E. The full August 2016 GIA report can be seen online here. Looking at the certificate you’ll notice beautiful proportions of a very small (by princess cut standards) 70% table and an equally attractive depth percentage of just under 70%. 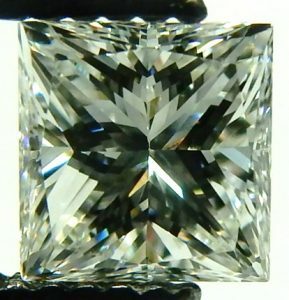 70/70 princess cut diamonds are very elusive because most cutting factories cut for maximum weight, not maximum beauty. 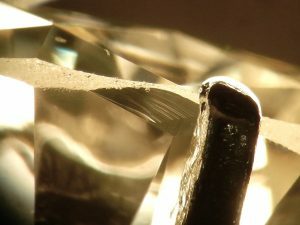 Since there are no recognized cutting standards established for princess diamonds, many are made to less than ideal proportions. Everything that could be controlled when this stone was cut, was done to achieve the most brilliant, sparkling, fiery diamond possible. Even the dimensions of 6.12mm x 6.10mm are less than 0.003% off perfectly square. I’m not sure what the lucky person who selects this diamond is going to do with it but whatever piece of jewellery it ends up in you can be sure it will be a one of a kind item. Estate priced at $13070.70 CAD. Stock #e9847. When it comes to diamond grading there is little argument that The Gemological Institute of America is the most widely recognized authority when it comes to non bias quality evaluation. These reports are usually only seen at premium jewellers who value an accurate document over the more sales oriented type appraisal report seen at most jewellery stores. Often these appraisal certificates are optimistic in their opinions of quality and price. GIA do not report on pricing as they are only interested in the quality of diamonds and other gems. The American Gem Society is another institution held in highest regard for their uncompromising standards. Some would argue that they have even tougher standards than GIA when it comes to cut grading. 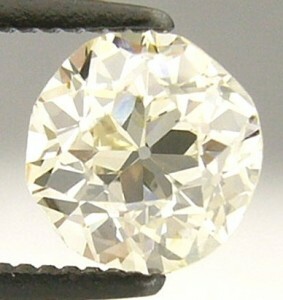 This diamond was compared to AGS standards for an ideal cut. Its geometry was perfect on all counts except for a slightly shallow crown angle of 32.9 degrees when it should have been no more shallow than 33.7 degrees. 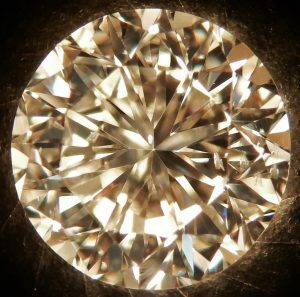 This 0.8 degree deficiency automatically rendered the diamonds cut to just excellent. In practical terms this means almost nothing but the strict AGS standards have a very closed range and this diamond just missed it. It sparkles and twinkles like a little ball of fire, in fact the cut is better than all but a tiny fraction of diamonds on the market. When viewed through polarized light the coveted hearts and arrows pattern reserved for only the finest of the finest cuts still reveals itself very well. Lets create something special for you. This diamond will make a great starting point for the high quality custom made engagement ring or dinner ring design that’s been on your mind for a while. 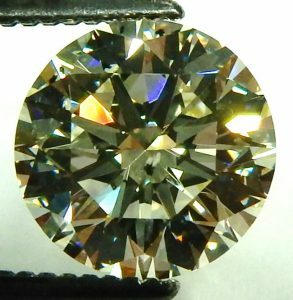 A strong SI1 clarity with H colour are also very good and better than most typically encountered diamonds. When is comes to value Bill Le Boeuf Jewellers always offers simply the best. This diamond including the cut report is estate priced at just $1275.00 CAD. Stock #e10590. Dealer and industry purchases welcomed. Nothing makes us happier at Bill Le Boeuf Jewellers than connecting our clients with beautiful diamonds, jewellery and watches at terrific prices. The value of our estate offerings (especially in loose diamonds) are quite often the best in the world. That’s a big statement but we’re quite serious making it. We compare our pricing with those of the most competitive cutting factories in Mumbai India and Israel. This diamond for instance offers as good or better value than any other of similar size, cut, clarity and colour on the market. Our on site Gemological Institute of America trained Gemologist has close to 30 years of grading experience. We’re recognized as very tough and old school when it comes to assigning a quality grade on a diamond. We strictly adhere to only GIA standards. This stone is a perfect example of a fantastic diamond just waiting to be the centre piece in a stunning ring or pendant. It explodes with brilliance and dispersion. The VS1 clarity is excellent. You’re going to need at least 10 times magnification in order to resolve the small white feather located outside the centre of the table at 3:00 o’clock. The superb F colour was determined by careful comparison to our 30 year GIA master stones. The optical fireworks come from the efficiency of the cut as this cut report details. A diamond cut to this sort of excellent standard exhibits close to total internal reflection. 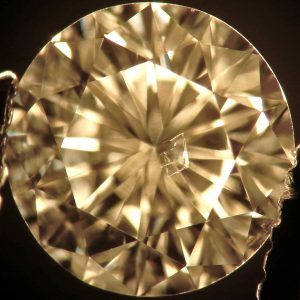 This means, as much light as possible entering the diamond bounces around within returning to your eye with incredible dispersion and brilliance. Only a superior cut diamond will produce such fire. A still photograph simply can’t begin to describe just how pretty this diamond is. Estate priced at $3000.00 CAD. Stock #e10539. Nice size, great looking diamond with an excellent colour. However; I have a difficult time accepting the European Gemological Laboratory opinion of SI2. Their certificate can be seen online here. 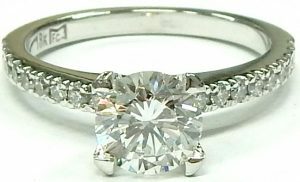 I’ve been a GIA trained Graduate Gemologist for over 25 years, and perhaps I’m just grading to a higher old school standard but this diamond appears to be an I1 in my opinion. 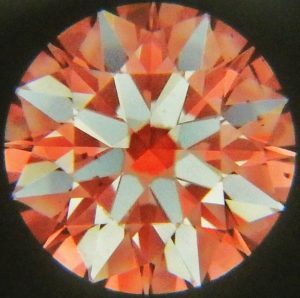 The size, shape, number, colour and location of the inclusions are just a little too significant for an SI2 grade when judged to GIA standards. That’s the thing; “grading to a known and consistent standard”. There are many certificates and appraisals available to consumers purchasing jewellery. Many are accurate and properly represent the diamonds, coloured gems and jewellery they describe. However there are some that are optimistic in the grading and do not reflect a typical selling price. As with any purchase, take your time and learn about what you are about to buy. Ask lots of questions and make sure a FULL refund is available if a second opinion of quality differs from what was supplied from the seller. At Bill Le Boeuf Jewellers we endorse certificates from the Gemological Institute of America. They do not participate in the commerce of diamonds and jewellery. They do not supply appraisals, only certificates of quality on loose stones. This way they’re able to remain unbiased in regards to grading quality. We would prefer NOT to supply an in house appraisal on jewellery sold by us because of the potential conflict of interest this practice creates. This diamond is very bright and brilliant courtesy of the F colour as confirmed by our GIA certified master diamond. Measurements of 5.66mm x 5.46mm x 3.85mm give the princess cut a good sized footprint for a 1.00 carat square stone. It’s an excellent starting point for a ring, pendant, earring or any other jewellery project you may have in mind. 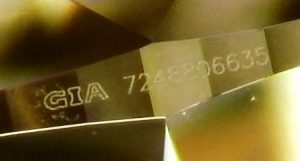 A microscopically visible ELG certificate number has been laser engraved along the girdle edge for easy identification. Estate priced at just $3900.00. Stock #e8662. Here’s a deal for anyone thinking of a jewellery project. There are times when we like to throw up a killer offer just to see who’s paying attention. If you have no use for a diamond of any kind then I’m sure you can find a better use for $1175.00. But if a nice pendant, ring or any other piece of jewellery is in your thoughts this is a value that can’t be beat. 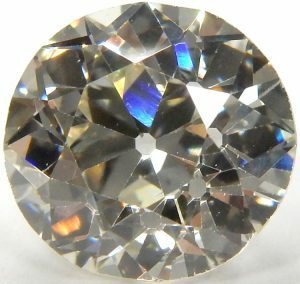 This 0.55 carat round brilliant cut measures an average of 5.27mm diameter giving it a footprint closer to many 0.60 carat average cut diamonds. 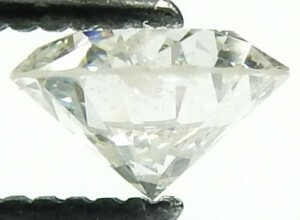 A small white feather at the 10:00 o’clock position within the table border gives it a conservative SI2 clarity (others may grade this type of diamond a SI1). As compared to our 1970s Gemological Institute of America master stones we’ve determined the colour to be a G (G master stone master on left, subject diamonds in centre, “I” master stone on right). The minor colour difference is difficult to see in this image as it is only represents 2 grades. Overall diamond dimensions of 5.25mm x 5.30mm x 3.12mm help to combine for an overall very good cut grade. 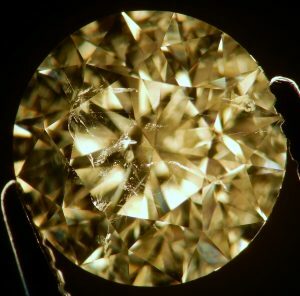 When exposed to long wave ultraviolet the diamond didn’t exhibit any fluorescence. 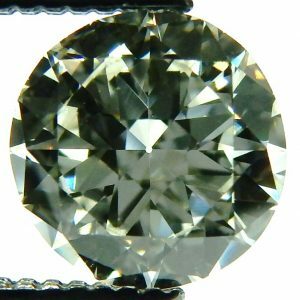 Shop this diamond around and compare the pictures and details to any other out there. We’re sure you’ll agree this one offers the best value around. Trade inquires or purchases welcome. Estate priced at $1175.00 CAD. Stock #e10552. When you’re not concerned about yielding the heaviest diamond possible, you can cut to exceptional standards and let the finished weight end up where it should. I had a difficult choice to make but I’m so happy I decided to go for quality over quantity (in the form of weight). This diamond came into our store with a significant chip partially covered up by a claw on the ring it was in. 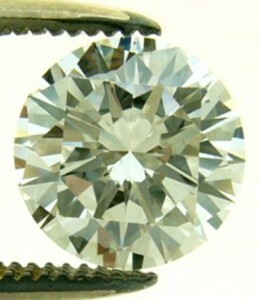 After removal from the setting the full impact of the chip could be seen on the 0.88 carat diamond. Initially I had hoped to maintain a re-cut weight of at least 0.70 carats but after consultation with our master diamond cutter he said to hold 0.70 plus carats the diamond would only rate a good or maybe a weak very good cut. Rather than compromise the cutting standards to get a heavier albeit less brilliant diamond we opted to go for an exceptional cut and I’m happy we did. The freshly remanufactured diamond now weights just 0.63 carat (over 28% lighter the original) but holy *#@%! does it ever sparkle. The cut report shows every aspect of geometry is ideal. With a strong clarity SI1 clarity grade we can guarantee no inclusions will be seen without artificial magnification. When compared to our GIA master colour comparison diamonds this one was confirmed to be a F, just about the whitest of all diamonds available. When exposed to a long wave ultraviolet light source it exhibited the preferred NO fluorescence. Although it weighs 28% less than original it only measures 10% smaller diameter so it can still fit in the original 3.9 gram 14 karat white gold Lucida solitaire setting available separately for $250.00. Here is an opportunity for a lucky person to take advantage of an exceptionally brilliant diamond at significant savings due to the pre-owned nature. The diamond is estate priced at just $1,800.00 CAD. Stock #e9594. Square or diamond shaped? You can’t go wrong when it’s a VVS2-E that’s been certified by the Gemological Institute of America. WOW, what a sparkler too. There is nothing more attractive than a high clarity DEF colour diamond. As jewellers we see many diamonds every day but less than 10% are this sort of clarity and colour. The August 2016 GIA report can be seen online here. Very good symmetry, very good polish and no fluorescence keep the crisp, sharp sparkle going. Even though it doesn’t quite weigh the magic 1.00 carat it has bigger dimensions than many poorly cut 1.00 carat or heavier princess cut diamonds. Freshly certified and priced right at just $6,100.00 CAD make for a very desirable diamond suitable for an engagement ring, pendant or let us find another to match for a killer pair of earrings. Stock #e9848. Freshly certified November 15 2016 at the world’s most respected laboratory, The Gemological Institute of America. This estate diamond represents a great opportunity for someone to get a great looking princess cut for far less than usual. The just under 1.00 carat weight of 0.98 carat keeps the price in check. A nice SI2 clarity with G colour ensures excellent transparency and sparkle. The GIA report can be seen online at www.gia.edu. 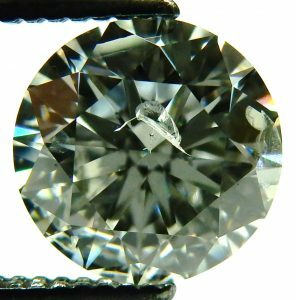 Buying an SI2 diamond can sometimes be a challenge as some SI2s have inclusions that are visible to the naked eye. 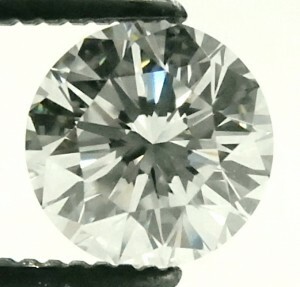 The grade setting inclusion(s) in this diamond are located off centre and are semi-transparent; our on staff diamond graders agree this diamond is “eye clean”. Eye clean means without artificial magnification there are no imperfections visible. The diamond measures 5.28mm x 5.18mm and is currently set in a traditional platinum solitaire with matching wedding ring, available separately for $760.00. 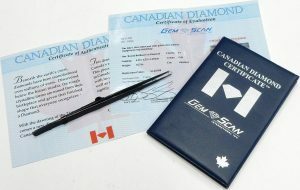 Including the GIA certificate plus an independent appraisal from April 2004 the diamond is priced at just $3650.00 CAD. Stock #e10052. This is my current favorite diamond. 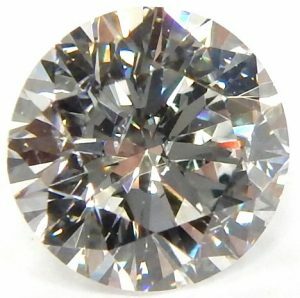 We have 1000s of diamonds in the store; most are smaller, a few are bigger, lots have a higher colour grade and they run the full range from flawless to heavily included. 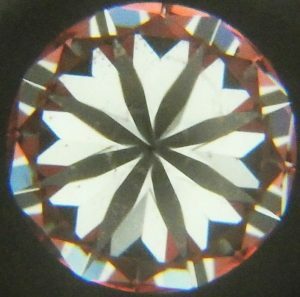 We find this one so interesting because of the unique inclusion located close to the centre of the table facet. Under minor magnification and even without, the sharp sighted can see a small dark inclusion. As magnification increases this totally random imperfection begins to take on a life of its own. 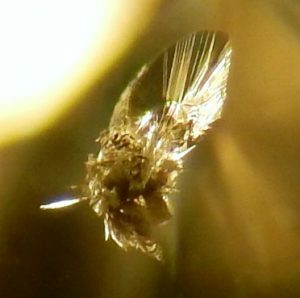 A cute little fruit fly looking insect reveals itself as a group of crystals, needle and a cloud all coming together to form the body, wing, and even the legs if you use a little imagination. When we stepped up the power and took a photomicrograph through our microscope you can really see the tiny intruder floating in an otherwise flawless diamond. Intricate wing structure looks amazingly realistic along with the furry body. 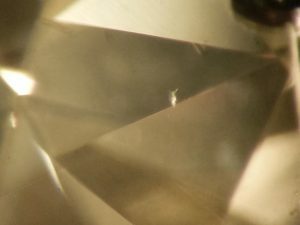 Natural diamonds are unique creations that formed deep within the earth’s crust under incredible pressure and heat about 4 billion years ago. Sometimes the carbon doesn’t crystalize 100% transparent and can take the form of a graphite speck completely cocooned within the diamond crystal. 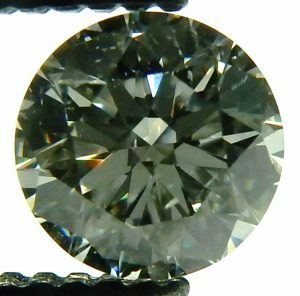 Inclusions like this are never seen in synthetic diamonds and along with medium blue fluorescence are proof of 100% natural origin. 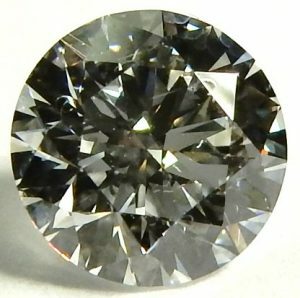 Without question the inclusion makes this diamond far more desirable than a similar quality diamond without such a unique imperfection. We just had this diamond certified at the Gemological Institute of America May 30 2017. The full GIA report can be seen online here. There are even those who go out of their way and seek out unusual inclusions. The diamond is available in a simple 14 karat white gold 2.9 gram white gold solitaire ring for $5250.00 complete, or we’d be happy to sell you just the diamond for $4950.00. Stock #e10545. Call us quick before someone else gets your diamond. Being a price conscience, value consumer and jeweller I really really like what this diamond has going for it. Nice size of just over one carat, fantastic F colour (according to our GIA certified master diamonds), very good cut, no fluorescence and a clarity that will appear waaaaaaaay better than I1 once it is set into a ring. Okay, it’s time to nerd out a bit about diamond clarity. When you’re considering clarity, bear in mind 5 things; size, shape, number, colour and location of the grade setting characteristic(s). 1; for size smaller the better. 2; the white feather at the 5 o’clock position is pretty small and compact for an I1 inclusion looking much better than a thin white feather that stretches across the stone. 3; one inclusion of reasonable size is much nicer than many (possibly 1000s) of tiny inclusions that make diamonds appear milky or dull. 4; a white inclusion is much harder to detect than an opaque black crystal type. And finally 5; just as in real estate it’s location location location. And for location the close to the edge mark is exactly where you want it. Strategic claw/prong placement will almost entirely cover the white inclusion depending how big the claw is. Even the other minor inclusion at 2 o’clock can be covered with careful claw placement. If you shop around you might even find a 1.00 carat I1-F very good cut for a little less than this one, but I’m positive you won’t find one as pretty. I1-Fs that look this good are very ellusive so don’t wait or you’ll miss this one. Perfect condition and estate priced at just $5185.00 CAD. Stock #e10425. 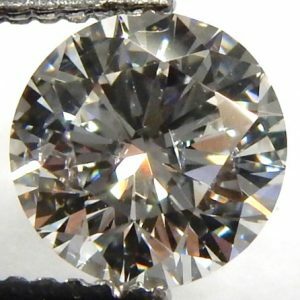 Virtually “eye clean” I1 diamonds are difficult to find and highly sought after. “H” colour diamonds look quite white without the premium price associated with DEF colour range stones. A very good cut promotes the brilliance, fire, scintillation and dispersion that only a quality diamond can possess. 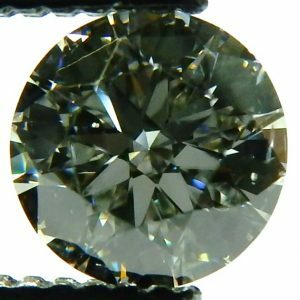 It’s certainly possible to find 2.00 carat round brilliant cut diamonds for well under $10000.00. 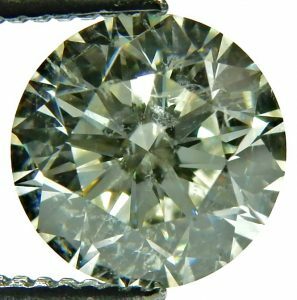 I’ll guarantee these bargain 2.00 carat diamonds will have easily visible inclusions, have a noticeable yellow to brown tint or they are very poorly cut. The inclusions in this example are small and scattered, having little effect on the transparency. Measuring 8.0mm diameter, this diamond has great finger presence in the brand new platinum Simon G ring. Model MR2615 is a brand new style for the California based designer. With platinum so reasonably price right now we decided to upgrade the metal from their usual 18 karat gold. 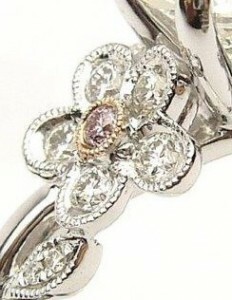 The 5 gram setting contains 16 white diamonds of VS-FG quality along with 2 small NATURAL pink diamonds. That’s right 100% natural pink colour. These incredibly rare diamonds make a striking contrast when set in 18 karat rose gold against the platinum. MR2615 is available in traditional 18 karat yellow gold, white gold, rose gold, platinum or any combination with prices starting at $2200.00 CAD. 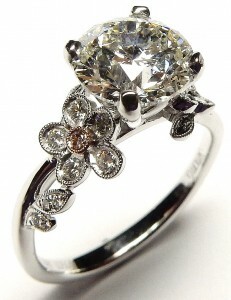 Estate diamonds make wonderful candidates to reset into a custom or production ring like this. You get fantastic savings on the largest component of value (the centre diamond) and a brand new modern Simon G setting that will leave her speechless. Bill Le Boeuf Jewellers specializes in certified estate and new diamonds. Nobody does “I do” like “we do” at Bill Le Boeuf Jewellers. 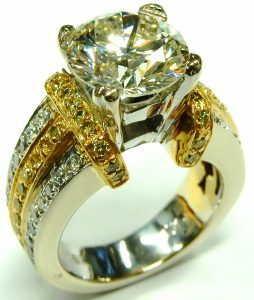 This half new, half estate ring is priced at $19108.00 CAD complete. The diamond by itself it is estate priced at $16000.00. Stock #e8679. I bet if you look long enough you’ll be able to find another GIA certified diamond of the same quality for about the same price as this (maybe even a bit less). I doubt you’ll find one that measures over 6.6mm average diameter as this one does. 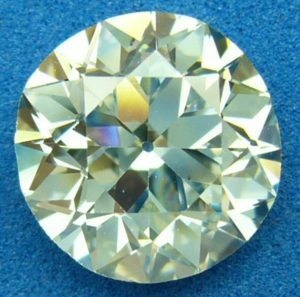 In fact most excellent cut 1.00 carat round brilliant cut diamonds only measure around 6.3mm to 6.4mm. The diamond business is all about hundreds of millimeters and this one looks more like a 1.10 carat due to the extra couple of tenths of a millimeter. A GIA summary report can be seen online here. The May 2015 Gemological Institute of America report is included detailing all the quality characteristics of VS1 clarity, F colour, excellent cut, very good polish, very good symmetry and no fluorescence. A handy plot found on the certificate is a very useful tool showing where the inclusions can be found and the type of inclusion. A final security feature this diamond has is a microscopic laser engraved certificate number (1176144312) laser engraved on the girdle edge. Let this diamond be the starting point for a spectacular engagement ring. 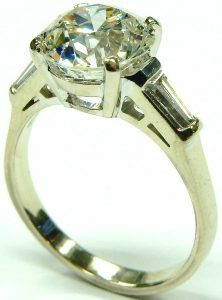 Or take it as is in the custom made 5.0 gram 18 karat white gold Michael Smiley solitaire for $500.00 more. Diamond only estate priced at $11200.00. Stock #e6995. Most times you should look at the diamond before you become subconsciously influenced by what you think it will look like from a report. The GIA report while 100% accurate with its assessment of SI1-G good cut simply doesn’t tell the whole story. 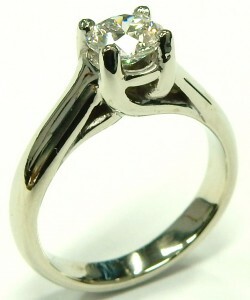 The medium sized culet (open point at the bottom in diamond) keeps the total depth to just 58%. This instantly keeps the overall cut from being very good or excellent. 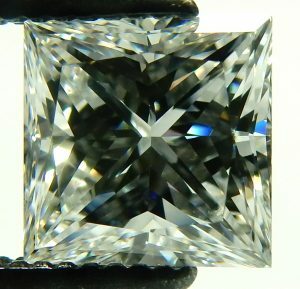 If you dismiss this one because it’s only a good cut you’re going to miss out on a very attractive diamond. Beautiful bright F colour and a strong SI1 clarity with big chunky pavilion main facets make it really pop. The just under 1.00 carat weight helps keep the price in check, plus the average diameter of 6.5mm makes it look bigger than most 1.00 carat diamonds. The full June 2016 certification from The Gemological Institute of America can be seen online here. The final characteristics that can affect appearance are a very good polish rating and no fluorescence makes the most of what this diamond has to offer. Let it be the starting point for a fantastic creation. We can custom make anything you can imagine. The diamond is currently set in a brand new 14 karat rose gold diamond halo creation containing 16 small accent diamonds. The setting is available separately for $1250.00.00. Including the GIA report the diamond is estate priced at $6000.00 CAD. Stock #e9637. There’s absolutely no questions about it. To get the biggest bang for the buck; you’re going to have to find a diamond with a slightly “softer” colour and one that isn’t flawless. 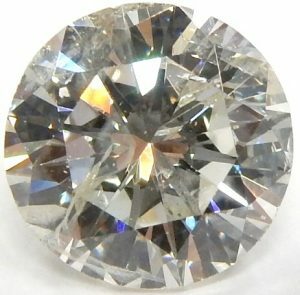 In a bang for the buck contest this 1.11 carat would be an excellent choice. With an average diameter of 6.37mm it certainly has presence on a finger, especially so when it’s been set on a skinny 2mm shank. The warm N colour certainly isn’t without a slight yellow tint but it has been cut to a very high standard, has excellent transparency, very good polish, very good symmetry and no fluorescence. These characteristics result in a diamond that dazzles with fantastic brilliance and dispersion. We’ve seen many diamonds with a better colour and clarity grade on paper that fall short of expectation in person because the are just hazy and dull. The SI2 clarity is still very attractive despite being 7 grades away from flawless. Without artificial magnification the dark crystal inclusion is completely invisible to all but the sharpest sighted. You can seen the inclusion in the top photograph at the 11:00 o’clock position about halfway to the table border. The centre diamond is currently set into a brand new 14 karat white gold ring with a string of 12 round brilliant cut diamonds set on the shoulders. The finished ring weighs just over 2.2 grams in a size 6 1/2. 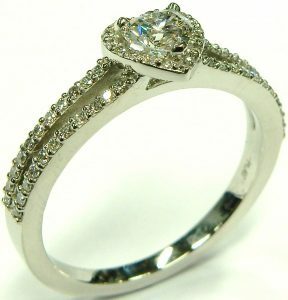 The diamond alone is offered at only $2474.00. The complete ring is estate priced at $2999.00 CAD. Stock #e10416. 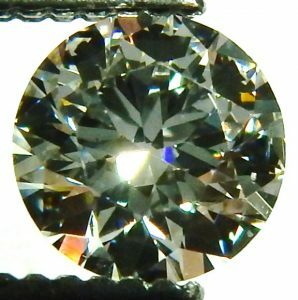 1.53ct. 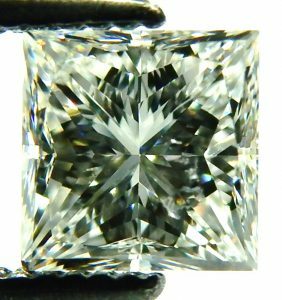 SI2-F Asscher cut GIA certified $10000.00 CAD. I’ve heard a rumor that there are some people who don’t like diamonds. 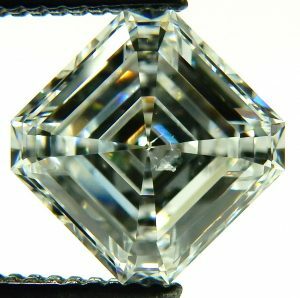 I bet those people haven’t seen a nice quality Asscher cut before. Very few of these have come in over the past half plus century here at 52 Dunlop Street Downtown Barrie. This may be the nicest one yet. There is really nothing not to love about this one. From its almost perfectly square, large 6.73mm x 6.71mm footprint, to the fabulous “F” colour, this one explodes with brilliance. I really don’t even mind the just eye visible knot inclusion just off centre. After all, unless you have exceptional vision it’s invisible. If the minor translucent inclusion wasn’t there, this diamond would cost around 75% more and would really only look better under a microscope. I’ll take the 7K in savings thank you very much. The Gemological Institute of America has certified the diamond a SI2-F with very good symmetry, very good polish and no fluorescence. Click here to see to full September 2016 report. You seldom see Asscher cuts although they are becoming one of the more asked for specialty cuts. The clean tailored symmetry and parallel facets are a refreshing optical treat compared to the more common brilliant cut, square princess and round diamonds. If you try to compare similar weight Asschers you’ll notice most only measure around 6.3mm x 6.3mm. This is because most are cut much deeper in an effort to conserve weight without any improved visual impact. 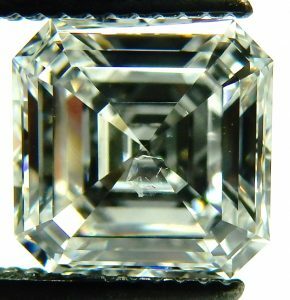 Trust me when I say finding a Asscher cut with a 58.9% depth is exceedingly rare and very desirable. The diamond is currently set in a high quality 18 karat yellow gold and platinum 7.6 gram setting (available separately for $1000.00). It’s ready to go as a fantastic engagement ring. If you have other ideas, come in with your imagination or even a picture of your dream ring and we’ll custom make it for you. The diamond alone is estate priced at only $10000.00 CAD. Stock #e10000. 0.62ct. I1-I excellent cut $1400.00 CAD. Once upon a time this diamond weighed the magic weight of 1.00 carat. It was sold to a person who didn’t understand how important an excellent cut is. The cut determines just how much brilliance and dispersion is produced. Originally it measured an average diameter of just 5.85mm and 4.10mm deep. It was perhaps the poorest example of cutting I has ever seen. It was waaaaay too deep, the girdle was much too thick, it had a giant extra facet on the lower half completely distorting the pavilion. Have a look at these before and after pictures. Even if you’re not a gemologist it’s easy to see what’s wrong with the original cut. We asked our master cutter to transform this ugly duckling into the beautiful brilliant cut that was locked inside the ugly exterior. The resulting diamond lost 38% of the original weight but now it explodes with sparkle compliments of the new found ideal cutting geometry. 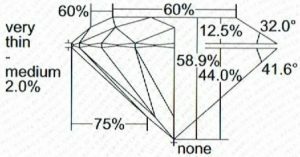 Every element from table percentage to pavilion angle is perfect as this cut report shows. Compared to the old lumpy, thick diamond the new one appears much thinner and symmetrical. The new cut displays total internal reflection that limits light leaking out the bottom and sides. It’s now a little ball of fire. 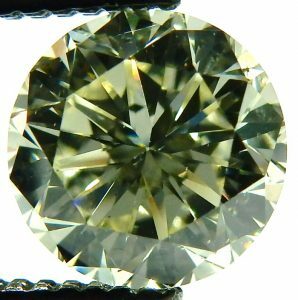 The reasonable clarity of I1 with a nice colour grade of “I” contribute to an affordable, great looking diamond suitable in an engagement ring, pendant or any other jewellery application you can think of. Cut matters more than any other characteristic. Even though the diamond is much smaller than the original it’s actually worth more. 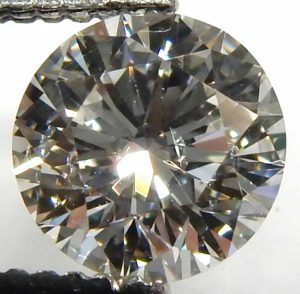 Please consider and learn about cut quality before buying a diamond. Estate price $1400.00 CAD. Stock #e9302. 0.62ct. 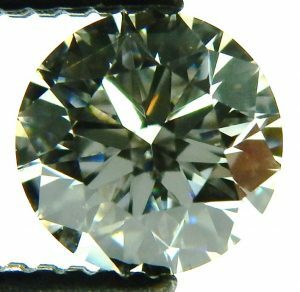 SI1-H excellent cut round diamond $1875.00 CAD. Beautiful diamond, just needs a new home. If you’ve got an idea for an engagement ring come on down. Our team of designer goldsmiths have helped create 1000s of rings and other jewellery items over the years. Use their experience to help build something extraordinary. This diamond has got a great balance of carat weight, clarity, colour and cut. The “4Cs” are well represented here and the 5th “C” of a really affordable cost is an added bonus. Although not absolutely ideal, the excellent overall cut grade is evident when the hearts & arrows test is deployed. These images clearly reveal the sought after hearts and arrows pattern. The details of the exact cutting geometry can be further reviewed by the cut report that comes included with purchase. If you’re not sure what to do with this diamond, I have an idea. How about using it matched up with another estate diamond to create a fantastic pair of earrings. Our stock number e9302 is an almost perfect match. We can have them ready to go in brand new earring settings in as little as an hour or so. What ever you decide to do with it we guarantee you fantastic value for the estate price of just $1875.00 CAD. Stock #e10259. 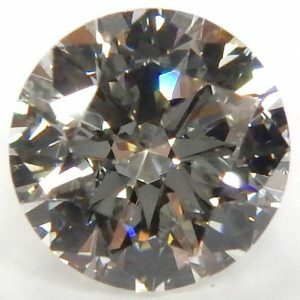 1.01ct. 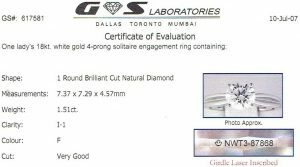 VS2-I very good cut GIA certified $6050.00 CAD. If you’ve found our website we thank you. If you’re looking for a special diamond you’re looking in the right place. Our estate diamonds represent some of the best values in the industry. 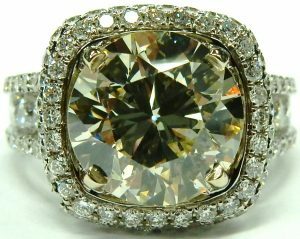 This diamond just returned from New York were it received certification from the most trusted name in the business. The Gemological Institute of America is a truly impartial opinion when it comes to certification of diamonds. They have no interest in the commerce of diamonds and they never supply an estimate of value, so there is no conflict of interest in their reports. Many retail jewellers use appraisals as sales tools and usually discount from an inflated value the report shows. The full GIA report can be seen online here. The VS2 clarity, I colour with a very good cut places this diamond in the better quality range. A further investigation of the certificate reveals very good polish, very good symmetry and no fluorescence (all desirable characteristics). The best thing about this diamond is the large footprint of 6.58mm average diameter. Most 1.00 diamonds measure only around 6.30mm diameter making this one look more like a 1.10 carat. If you have a look at other 1.00 to 1.10 carat diamonds you’ll notice the actual diameter is likely quite a bit less than our example. The valuable June 2016 GIA certificate is included with this diamond for the estate price of $6100.00 CAD. Stock #e9689. 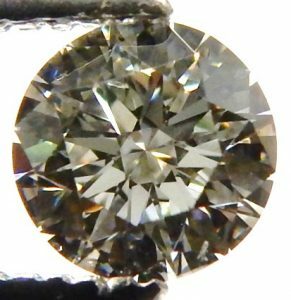 0.55 carat VVS1-H excellent cut $1925.00 CAD. One extremely small microscopic white feather is the only clarity characteristic keeping this diamond from being graded flawless. It took several attempts under a high power microscope to reveal the minor inclusion. Grading the colour was a fairly straight forward process by comparison with our GIA certified set of master stones. Excellent cut is apparent just from observation but the cut report confirms the perfect proportions showing nothing but ideal geometry. 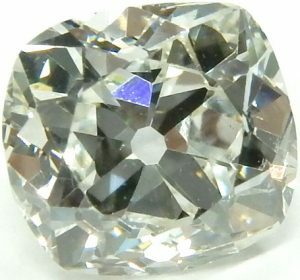 When exposed to a long wave ultra violet light source the diamond exhibited medium to strong blue fluorescence that actually gives the diamond closer to a FG colour range. 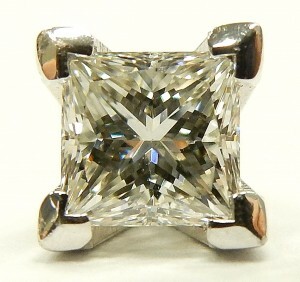 Weighing nicely over 1/2 a carat at 0.55ct. this diamond is quite likely the least expensive example on the market today. Estate priced at $1925.00 Canadian. International shipping by FedEx available. Stock #e8836. 0.43ct. SI2-F modified Crisscut diamond $850.00 CAD. 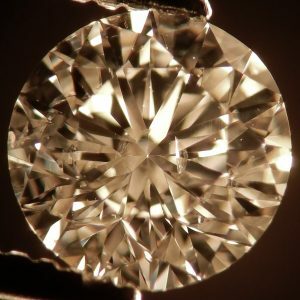 Since the round brilliant cut geometry was perfected close to 100 years ago many different shapes have evolved from it. Square, heart, oval, pear and marquise all have the same facet pattern just laid out on a different shape. Every once in a while a diamond cutter tries to improve on the formula. Most simply don’t look as good or are simply slightly modified versions proclaiming to be more attractive. The one original cut that I personally think is a worthy contender to the brilliant cut is the Crisscut emerald. While this example is not a true patented Crisscut emerald cut. It shares most of the design, lacking only a few corner facets on the pavilion and crown. At under half a carat you’ll never notice the missing facets on this one. Measuring 5.37mm x 3.38mm x 2.55mm this sparkling 0.43 carat rectangular shaped diamond would make a great pendant or maybe the starting point for a very cool and unique engagement ring. Perfect for someone who wants a bright sparkling stone that’s a little different. The SI2 clarity looks flawless without artificial magnification. The F colour is virtually colourless and way better than most diamonds available. Estate priced at only $850.00 CAD. Stock #e9532. 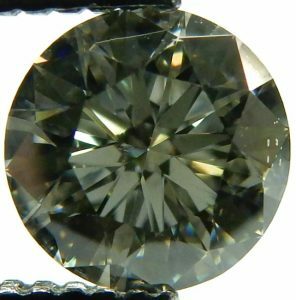 0.99ct. 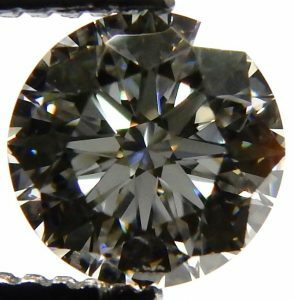 VS2-K Old European cut diamond $4000.00 CAD. When we received this diamond it was suffering from evidence of more than 100 years of daily use in the form of several chips along the girdle edge. I’d imagine this diamond was a cherished keepsake for several generations, worn everyday through thick and thin. When presented to us the diamond was practically falling out of the 18 karat white gold setting. Claws were either totally gone, bent or completely worn away and a shoulder diamond was missing. This was at least the second ring the diamond had already outlived. After consultation with our master diamond cutter, the decision was made to retain the original spirit and maintain the old European cut design. With careful placement of a couple small extra pavilion facets and reducing the diameter by just a few tenths of a millimeter, the “new-old” diamond looks perfect. The following images are before and after pictures showing the subtle repair. Remarkably, we only lost 0.02 carat of weight (0.004 grams) resulting in a diamond weighing just shy of 1.00 carat, measuring 6.25mm – 6.28mm x 3.72mm. The very nice VS2 clarity means the diamond is completely free from any type of distracting inclusion. The K colour will never be confused with a ultra white D, but the soft hue is 100% appropriate for a diamond of this age as most diamonds from this era are from South Africa. JKLM are the typical colours for diamonds found in this region. For the estate price of just $4000.00 CAD, you get fantastic value and a rare antique diamond of significant size. 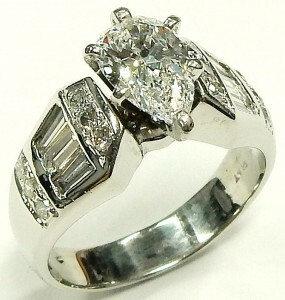 Currently set in a 14 karat white gold ring available separately for $1150.00. Stock #e10161. 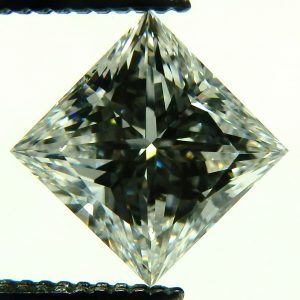 1.03ct. 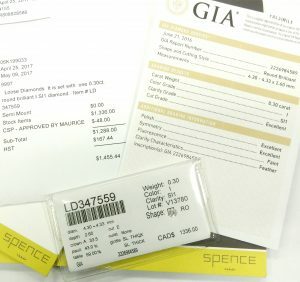 SI2-F GIA certified very good cut “eye clean” $6675.00 CAD. Diamonds like this are VERY hard to find for a great price and they get snapped up quite quickly. Buying a SI2 diamond grade can be a frightening thing. 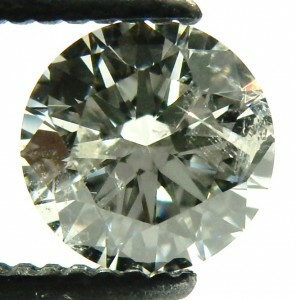 SI2 clarity diamonds usually have inclusions that can be seen without magnification. If the inclusion is located within the octagon table close to the centre the blemish is almost always visiable. The inclusion in this example is almost perfectly located on a star/bezel facet junction at the 1:00 position. This type of inclusion is called a knot. A knot is a small diamond crystal that grew within the larger gem and shows through the surface when the diamond has been polished. Basically it’s like a knot in a piece of wood. It is usually identified by a semi-transparent border that surrounds the small exposed crystal. 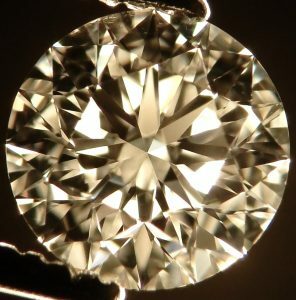 This diamond appears flawless without magnification. With careful claw placement the inclusion will almost disappear when set in a suitable piece of jewellery. The GIA report (July 2015) graded the colour an excellent F, with a very good overall cut and no fluorescence. Trust me when I say this is a very desirable diamond that shouldn’t last. If you’re looking for a knockout 1 carat diamond look no further. This one has all the right boxes checked off for the absolute best value ANYWHERE. Estate priced at $6675.00 CAD. 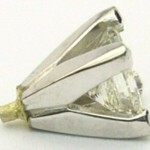 Currently the diamond is mounted in a simple 3.0 gram, 18 karat white gold setting available for $325.00 extra. Stock #e9024. 1.10 carat I1-G good cut $5000.00 CAD. 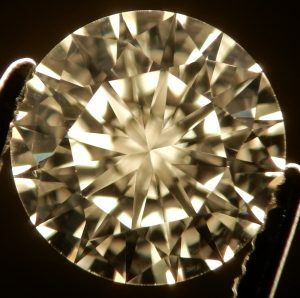 The scarlet letter for diamonds when it comes to clarity is “I”. Although the “I” grade stands for inclusion(s) in doesn’t tell the entire story. Most accurately graded “I” clarity diamonds are quite attractive as long as the colour and cut are within the range you’re considering. 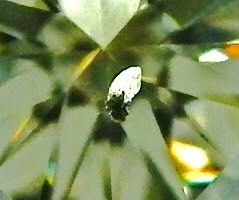 The inclusions in this particular diamond are small and scattered. Viewed individually there isn’t a single one that would qualify the grade but collectively a grade of I1 is the correct call. The colour as compared with our GIA master diamonds is an easy G, it may even make a F if it was submitted to The Gemological Institute of America for certification. The cut is good if not great with measurements of 6.43mm – 6.50mm x 4.05mm. If you wanted to have the diamond recut it could easily achieve a very good grade and possibly even an excellent cut could be had while still maintaining a 1.00 carat finished weight. I’m still thinking about having the cut improved then sending it away to GIA in New York for certification. I’m just not sure whether the added cost for these services are truly worth the small improvement in sparkle and dispersion you would actually see. In the meantime this bright beautiful diamond is showcased in an estate 18 karat white and rose gold Simon G ring (model number MR2615) available separately for $1800.00. The estate diamond alone is priced at just $5000.00 CAD. Stock #e9774. 0.84ct. VS1-G GIA certified $5150.00 CAD. Grading diamonds is mostly science and partly art. Some characteristics are specific and quantifiable. There can only be one weight and the geometry of cut is really just defined ratios and angles. When it comes to grading the colour and clarity there is a small amount of variance and opinion. When does a low G colour become a H or when does a high SI1 clarity become a VS2? Sometimes it’s hard to buy a diamond just on a grading report alone (assuming of course the report is accurate to begin with). This diamond was purchased at Spence diamonds in the summer of 2014 for over $10000.00 tax included. 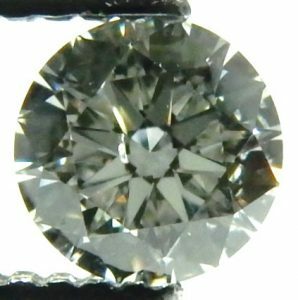 The in house Spence diamond grader decided the 0.84 carat round brilliant cut diamond was a VS2-H with a good cut, making for a very nice looking diamond. 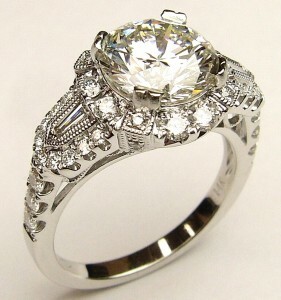 When this ring came in on trade we thought a more industry recognized opinion of quality was in order given its value. We removed the diamond and sent it to the Gemological Institute of America for a formal certification of quality. The November 2016 report can be seen on line here. If you check the GIA report you’ll notice the clarity and colour are each grader 1 higher at VS1-G. GIA concurred with the Spence cut grade of good. I must commend Spence Diamonds on their cautious approach on the grading of this one, they delivered more than promised. 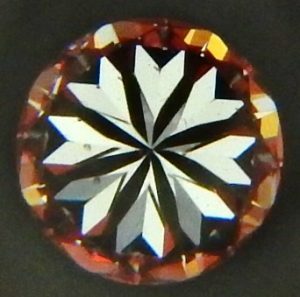 The GIA report describes the symmetry as very good along with very good polish and no fluorescence. The diamond comes with the Spence appraisal and original bill of sale. Also included with the ring is the November GIA certificate. Estate priced at $5150.00 CAD. The stone is currently set in a 19 karat white gold ring with 0.40 carats of additional diamonds set on shoulders, available separately for $660.00. Stock #e10055. Yup, it’s a big one. Lots of 1.00 carat diamonds come and go through our doors. 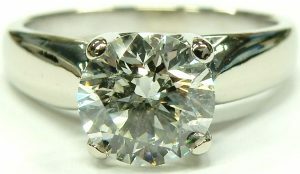 Even 2.00 carat diamonds are not too unusual with our clients, but at over three and a half carats this one is a rarity. 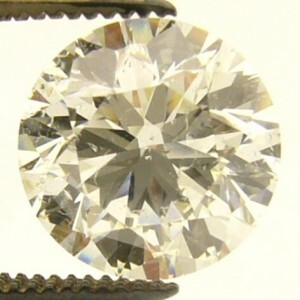 Assuming the quality of a given diamond is average to good, the biggest characteristic affecting the value is the size. A general rule of thumb that applies to round diamonds is, “as the size doubles the price quadruples”. To put that formula into perspective consider that buying a reasonable quality 1.00 carat diamond (GIA certified I1-K) will cost around $3000.00. So a 2.00 carat is going to cost $12000.00 and a 4.00 carat version of the same quality will be over $40000.00. Try it on our diamond database search and you’ll soon see the formula works pretty well. My point of all this is to demonstrate what a great value this estate diamond is. The clarity is a really good GIA certified VS1, the cut, symmetry and polish are all certified good. The diamond also has no fluorescence and the colour is a N. Yes that’s right a N colour. It’s a little warm with just a hint of yellow, but oh boy it sure sparkles. Keep it clean and this diamond will outshine any of the more garden variety size diamonds your likely to encounter. The Gemological Institute of America report can be seen here. I’m not sure what we’ll end up doing with this diamond but I think a simple solitaire engagement ring would be a great way to showcase it. You will be surprised at how nice a N colour can look in the right setting. We feel this substantial diamond is the most competitively priced in its size and quality range anywhere. Estate priced at $28000.00. Dealers welcome. Stock #e8918. 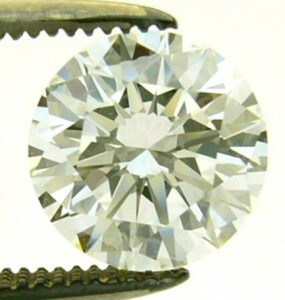 2.32 carat VS1-F excellent cut GIA certified $49725.00 CAD. Some will say diamonds are relatively common when compared to high quality coloured stones like sapphire, emerald and ruby. However, in the grand scheme of things diamonds are still extremely difficult to find in larger sizes. 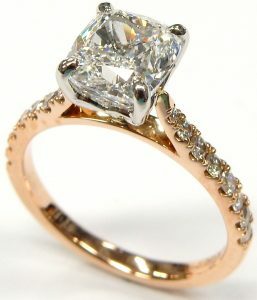 If you also factor in excellent colour, excellent clarity and excellent cut; that makes for a very rare diamond indeed. 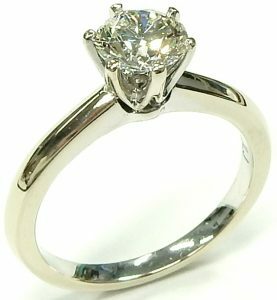 From our in store diamond data base of almost 400000 stones only about 1 in 1000 are of this size and quality or larger. The prices for these rare, large, high quality diamonds are ALL over $50000.00. We genuinely believe this is the most competitively priced diamond in the world of this size/quality that is GIA graded. The August 2015 Gemological Institute of America certificate can be seen on line here. If you’re considering an important diamond for a special piece of jewellery this year keep this one in mind. Please shop the specifications around to confirm the amazing value of this one. VS1 clarity is well above the threshold where inclusions can be seen without magnification and this VS1 is particularly nice because the table is completely clean. 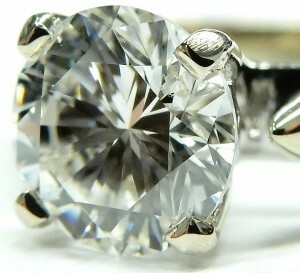 The minor grade setting inclusions can be covered up with a strategically placed claw. F colour grade is excellent exhibiting no yellow, brown or grey tint. Very good symmetry, very good polish and no fluorescence are the other characteristics that play an important roll in valuing this diamond. Please remember how important the certificate issuer is. There are many diamond certificates and appraisers who use the GIA’s terminology and language but don’t grade to the same strict standards. A GIA certificate costs a little more and doesn’t even assign a value but the piece of mind is priceless. If you’re going to spend well into 5 figures for a diamond take some time and watch this video by Martin Rapaport where he discusses overgraded diamonds with inaccurate reports. Mr. Rapaport produces a wholesale diamond price list that is widely followed in the industry. This guy knows his stuff. This diamond is currently set in a brand new hand made 14 karat white gold halo setting available separately for $3600.00. Estate price for the diamond by itself is $49725.00 CAD. Stock #e9138. 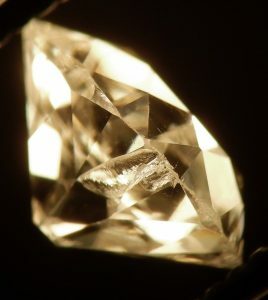 1.13ct. 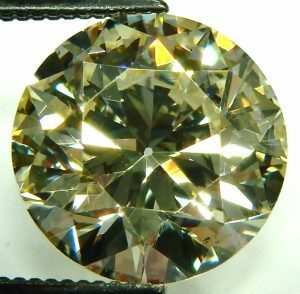 SI2-L European cut antique diamond $3870.00 CAD. 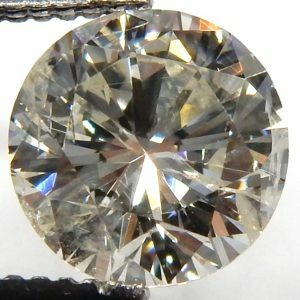 Where can you get a great looking 1.00 carat round diamond for nicely under $4000.00? The only place I can think of is the estate department at Bill Le Boeuf Jewellers, but then again I am a little biased. Sure you can find 1.00 carat diamonds for less, but I’ll guarantee they will be of low transparency, hazy, dull, have very poor colour and likely are poorly cut. Put them on a scale and they’ll weigh 1.00 carat but they will likely look much smaller because of a small diameter of only about 6.0mm. Our antique 1.13 carat example measures 6.25mm – 6.50mm x 4.28mm and has the right “footprint” for a diamond of over 1.00 carat. The strong SI2 clarity looks flawless without magnification. The colour is a little warmer and compares nicely to our GIA certified master stone of L colour. When the diamond is mounted, the abundance of dispersion caused by the tall crown and small table of these old diamonds helps to control the colour quite well. For something manufactured well over 100 years ago you’ll be amazed how nice these old stones look when compared to a modern brilliant cut. 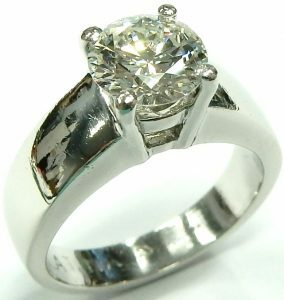 We currently have the diamond set in a simple 4.3 gram 14 karat white gold setting available separately for $350.00. Diamond only is estate priced at $3870.00 CAD. Stock #e9152. 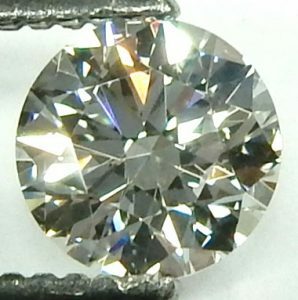 1.23ct. VVS1-M excellent cut with strong fluorescence $4800.00 CAD. Before you dismiss this diamond because of the M colour, please consider the other characteristics that determine the price. First of all it is nicely over the benchmark 1.00 carat size at 1.23 carats. The clarity is only one grade from flawless coming in at a VVS1 and the cut is excellent. 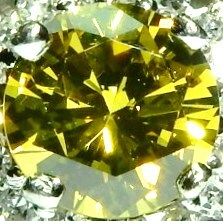 Fluorescence is common to about 30% of all diamonds, but only about 3% glow with this sort of intensity. For a stone with a warmer colour (JKLMN…..) the blue glow actually improves the apparent colour a minimum of a couple grades. This is because blue is the complimentary colour of yellow and conceals the effect. Included with purchase is a small cut report outlining the excellent cutting geometry that make this one sparkle better than most. At over 7.0mm diameter this diamond is waaaaaay bigger than the standard size 1.00 carat. Most people consider the “4Cs” (clarity, colour, carat weight and cut) when selecting a diamond, but don’t forget about the 5th C. The “cost”. The cost of this estate diamond is what makes it an exceptional value. For $4800.00 CAD we feel this is one of the best deals on the market. This is a diamond that needs to be seen in person. 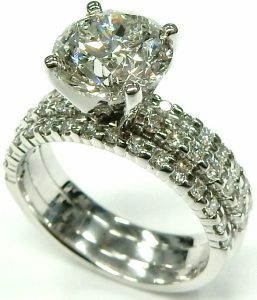 Currently set in an 18 karat engagement ring with diamond set shoulders; available separately for $884.00. Stock #e9269. 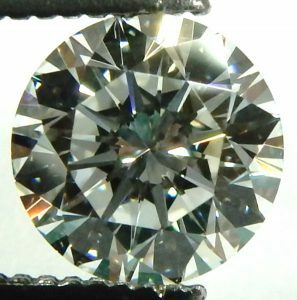 1.75ct. 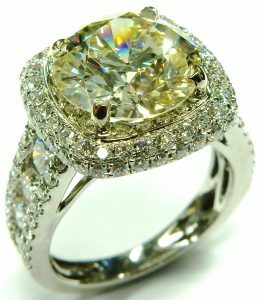 VVS2-J European cut GIA certified $18500.00 CAD. There are not too many of these around. European cut diamonds have not been produced since around 1930, although a few specialty cutters are making them for reproduction jewellery. When this diamond was cut around 100 years ago few people could afford any diamond, never mind a 1.75 carat. A Gemological Institute of America report issued (Feb. 2015) comes included with purchase and is your assurance of accurate grading. The GIA report can be seen here. 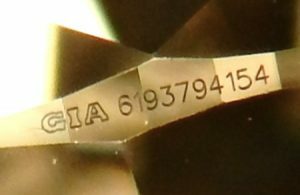 The diamond has been microscopically laser engraved along the girdle edge with the unique certificate number. 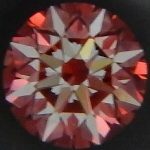 The diamond grades an excellent VVS2 clarity with a nice colour grade of J. Most diamonds from this era were mined in South Africa and as such usually exhibit a certain degree of colour. It’s not uncommon to see MNO colour or lower grades when looking for antique diamonds, so the J colour is very respectable. A tiny 48% table with a tall crown produce much more dispersion than even an ideal cut modern round brilliant. Currently set in a brand new American made 14 karat white gold setting weighing 4 grams including two 0.03 carat extra diamonds. The setting is available separately for $690.00. Diamond only is estate priced at $18500.00 CAD. Stock #e8804. 0.67ct. SI1-H excellent cut $2300.00 CAD. Most people pay little attention to the quality of cut when buying a diamond. Everyone asks about the carat weight, clarity and colour but it’s the 4th “C” of cut can make or break the beauty of a diamond. Without considering the quality of cut, a 0.70 carat diamond can easily sell for 25% more than a 0.69 carat if all the other characteristics are the same. This extreme price premium for such a small size difference is why you seldom see excellent cut round diamonds in the high 0.60 carat weight range. Which brings us to this beautiful estate 0.67 carat diamond. When we received it, it was a 0.75 carat antique European cut measuring 6.00mm – 6.15mm x 3.35mm with a chipped edge. It had the size and looked okay but lacked some brilliance because it was cut too shallow at 55%. 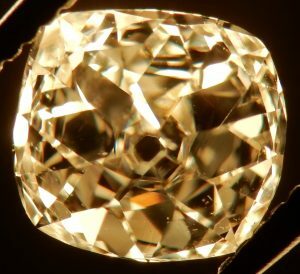 After our master diamond cutter plied his craft the resulting stone weighed 0.67 carat with a depth closer to 60%. While not a truly absolute perfect cut, this diamond does fall within The Gemological Institute of America geometry guidelines to be considered an excellent cut. It displays the much coveted hearts and arrows effect, although ever so slightly broken up. The SI1 clarity ensures you won’t see any inclusions without magnification. As compared to our set of GIA colour master diamonds, a nice bright “H” colour was determined. It’s bright, lively and shows no fluorescence of any kind. In the case of this specific diamond it’s honestly much better then when it was new close to 100 years ago. We’re pretty confident it’s the best value around at the estate price of just $2300.00 CAD. Stock #e9981. 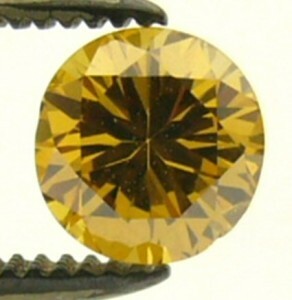 1.51ct. I2-G GIA certified. Very good cut, symmetry and polish $7600.00 CAD. I have never seen an I2 diamond that looked this good. 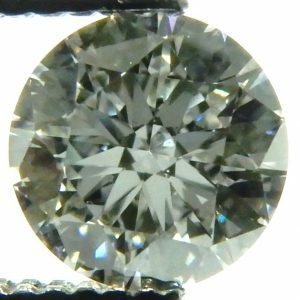 Almost all the diamonds I have seen that received an I2 clarity grade are very “optically challenged”. 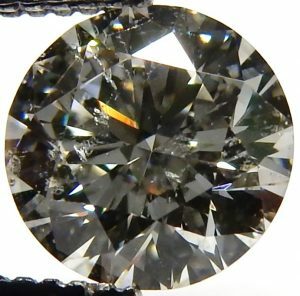 The grade usually indicates diamonds that have significant inclusions that adversely affect transparency and often times make the diamond look dull and lifeless. This diamond has none of those characteristics. It’s bright, lively and very transparent. While there is an inclusion close to the centre and a less significant inclusion at 3:00, they really don’t affect the brilliance in any measurable degree. The November 2016 Gemological Institute of America certification can be seen online at www.gia.edu. 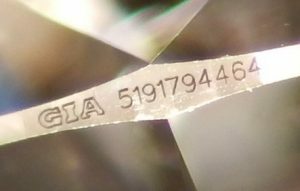 This diamond is of Canadian origin complete with a unique laser engraved serial number that tells us the diamond came from the North West Territories. It also comes with a Gem Scan certificate of evaluation. Gem Scan’s opinion of the clarity and colour are better than those of the GIA, with an I1-F grade. It comes in a Peoples Jewellers portfolio with a Government Certificate of Authenticity plus an appraisal. The summer of 2007 appraisal places a replacement value of $17400.00 plus tax including a 4.6 gram 18 karat solitaire setting. The diamond is currently set in the 18 karat setting and has two matching diamond wedding rings available for an additional $1710.00 (for all three rings). Stock #e10054. The diamond by itself is estate priced at just $7600.00 CAD. For $7600.00, I’m sure is the best looking stone of this size/quality you’ll ever see. Stock #e10054. 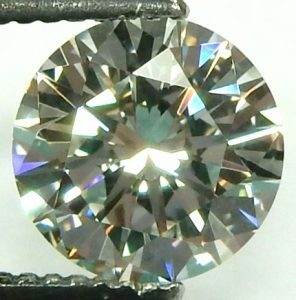 1.00ct. 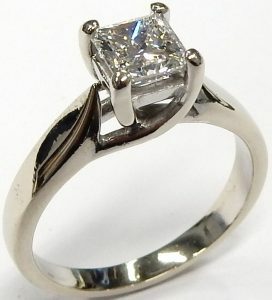 SI1-L princess cut $2500.00 CAD. From the picture you can probably see this diamond isn’t totally square. It’s only off about 5.5% from having all sides of equal length but the human eye has a great ability to interpret very minor differences. Actual measurements of 5.7mm x 5.4mm are still pretty close though. When mounted in a simple solitaire the difference becomes more difficult to see. Most princess cuts are made to be pretty close to square, over 90% have a length to width ratio of less than 1.00:1.06 as sampled from our database. Any longer and manufacturers typically choose a different shape to cut a given piece of rough from. Our lively 1.00 carat example was originally purchased from Spence Diamonds as the polished girdle has been laser engraved with the Spence logo along with a European Gemological Laboratory certificate number (CA91700401D). The clarity is an “eye clean” SI1 meaning no inclusions are visible without artificial magnification. By comparison to our Gemological Institute of America master diamonds, we determined the colour to be a slightly softer L. This L colour grade has a very slight yellow tint but still allows the diamond to sparkle showing a rainbow of dispersion. The L colour grade along with the estate history keeps the price in check allowing you to get a really nice looking 1.00 carat diamond for way less than you’d expect. We currently have the diamond set into an American made traditional solitaire ring that weighs 4.3 grams made from premium quality high grade 950 platinum. The finger size 6 ring is available separately for only $370.00. If you would like to set the diamond into a different style custom or production setting you can purchase it alone for the estate price of just $2500.00 CAD. This is a fantastic value that we hope you compare with what else is available at a similar price. Stock number #e9943. 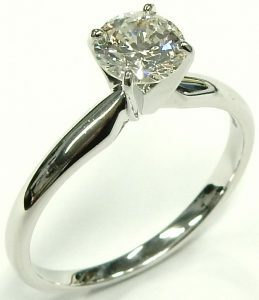 2.02 carat I1-I2-KL pear shape brilliant cut $3900.00 CAD. 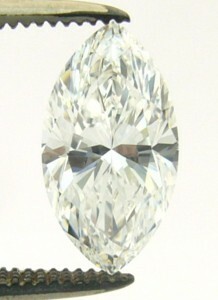 A perfect pear shaped diamond of this size would cost over $50000.00 CAD. So at only $3900.00 you’ll have to accept a somewhat less than flawless clarity and D colour. The clarity is a low I1 to strong I2 so there are several white feather type inclusions that are visible without magnification. The colour is in the KL range when compared to our GIA certified master stones so it does exhibit a very slight warmer tint. Measuring 10.00mm x 7.40mm x 4.57mm the diamond looks really big and on our calibrated scale it shows 2.02 carats. 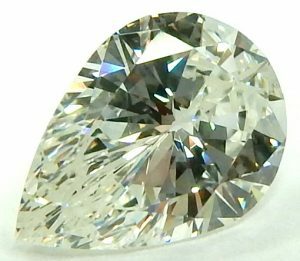 No it’s not perfect but at over 92% less expensive than a perfect 2.00 carat pear shaped diamond the value is very compelling. It faces up quite well and looks great when assembled in a finished piece of jewellery. 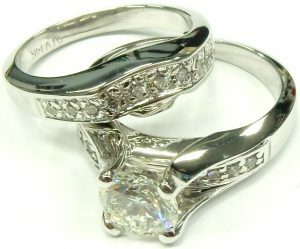 Currently set in a custom made 14 karat white gold 3 stone ring with two additional pear shaped diamonds available separately for $2100.00. Stock #e8955.